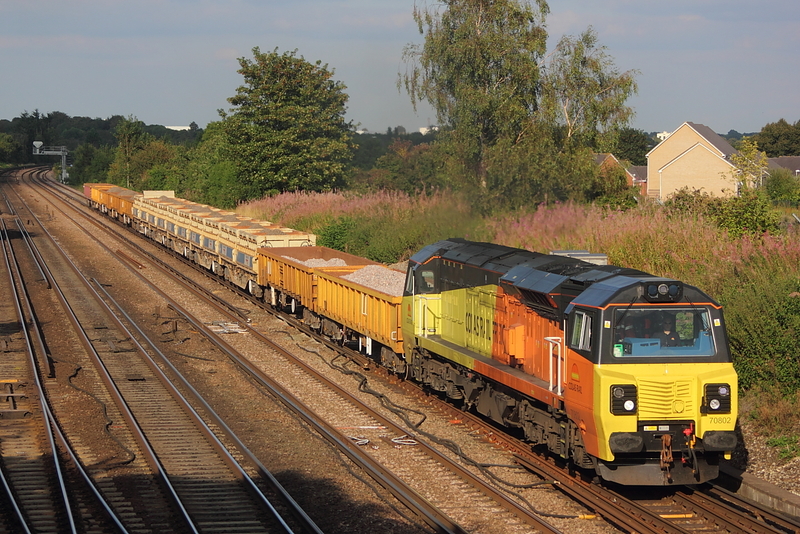 70804+66744"Crossrail" DIT 6Y42 Hoo Jnct to Eastleigh engineers. ​ 70804+66187 DIT 6Y42 Hoo Jnct. 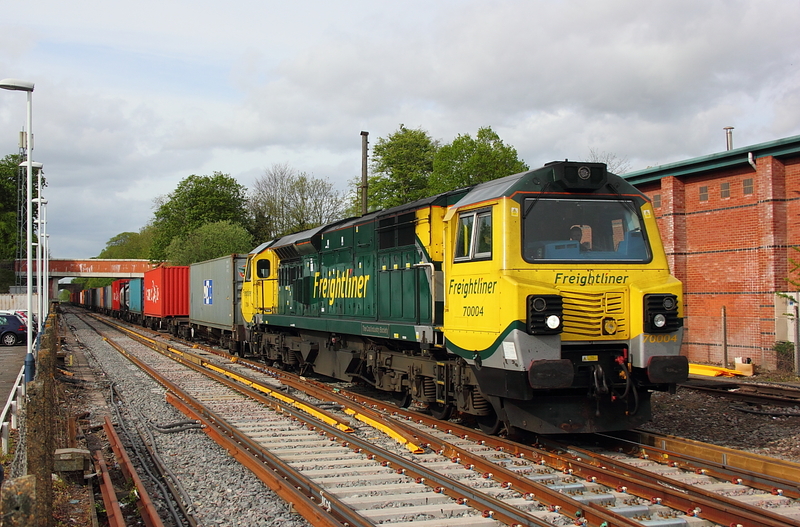 to Eastleigh East yard engineers. 70807 6Y42 Hoo Jnct. to Eastleigh East yard engineers. ​ 70020 4o14 Crewe to Southampton liner. 70806 6Y42 Hoo Jnct. to Eastleigh east yard engineers. 70005 4M99 Southampton to Trafford Park liner. 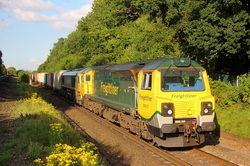 ​ 70015 4O90 Leeds to Southampton liner. 70011 4O57 Wentloog to Southampton liner. 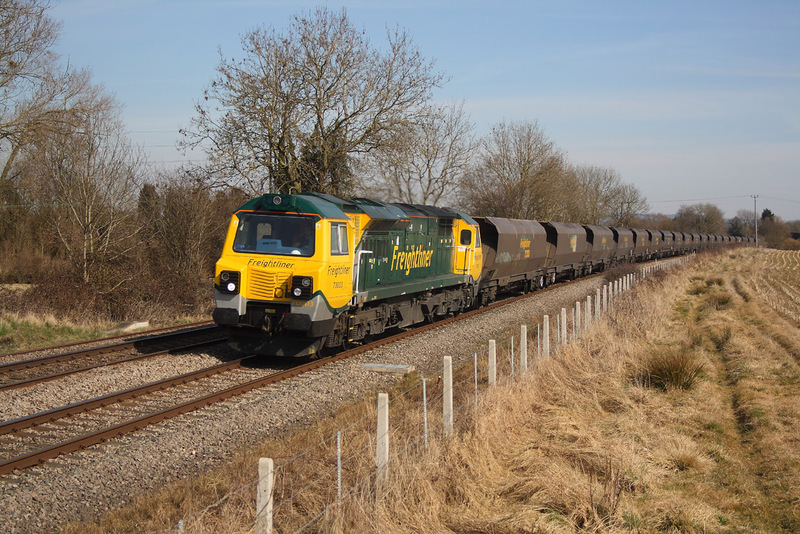 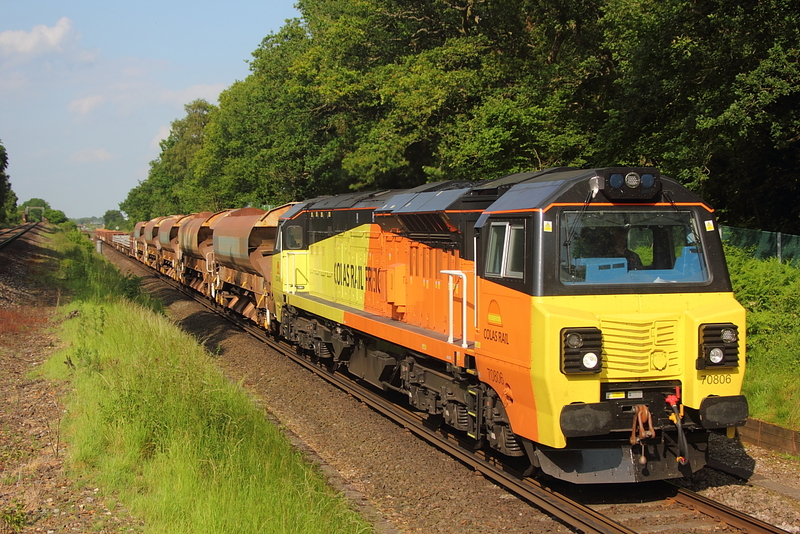 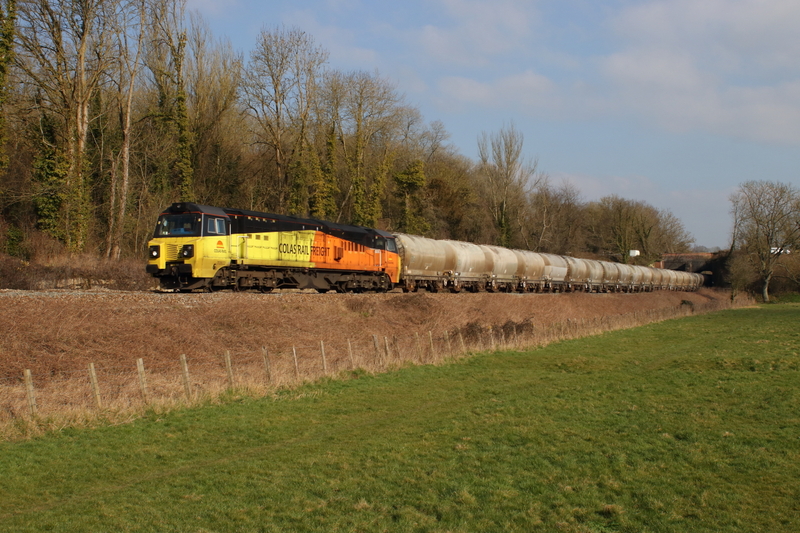 70806 6C35 Moorswater to Aberthaw cement empties. 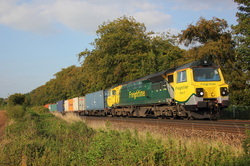 ​ 70011 4m61 Southampton to Trafford Park liner. 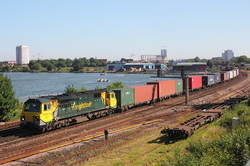 ​ 70802 6Y42 Hoo Jnct. 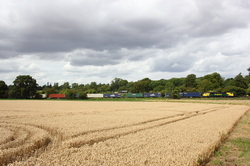 to Hoo Jnct. 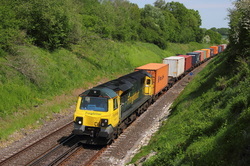 engineers. 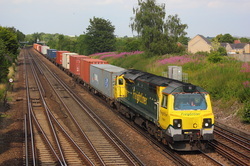 ​ 70814 6Y42 Hoo Jnct. 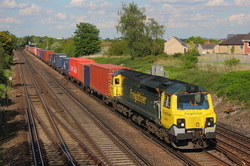 to Hoo Jnct. 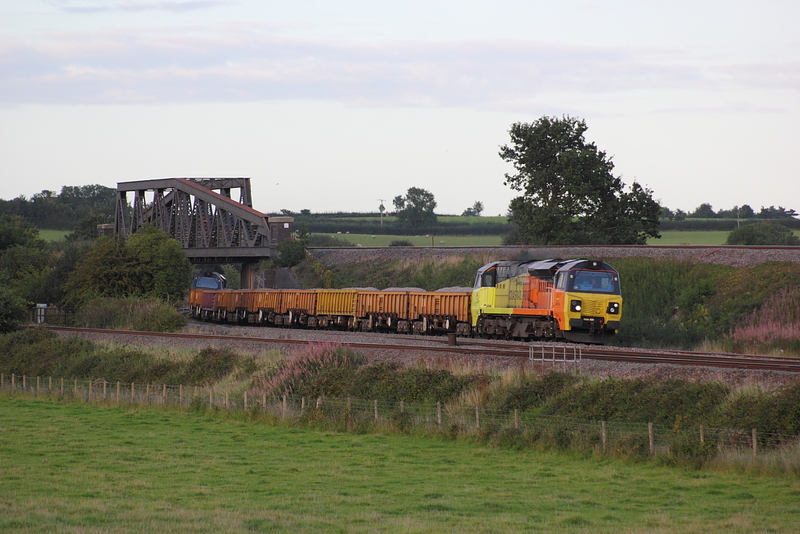 engineers. 70815 6Y42 Hoo Jnct to Eastleigh east yard engineers. 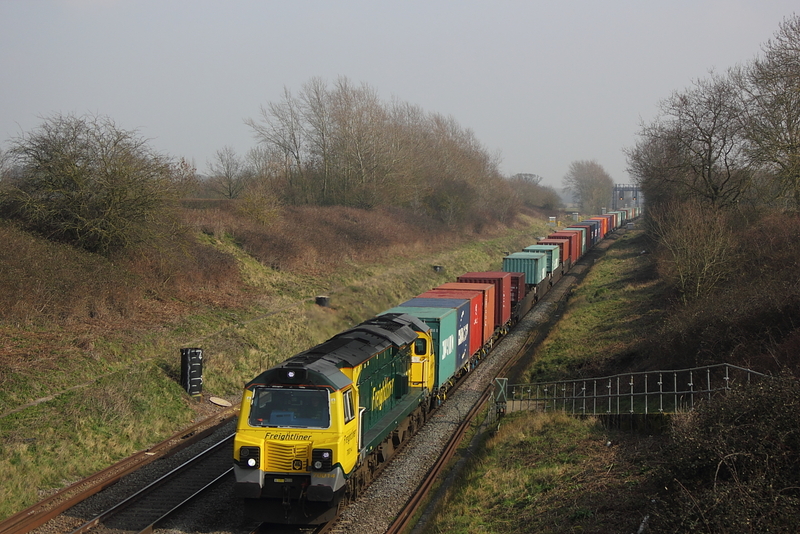 70015 4L52 Garston to London Gateway liner. 70810 6Y42 Hoo Jnct. to Eastleigh East yard engineers. 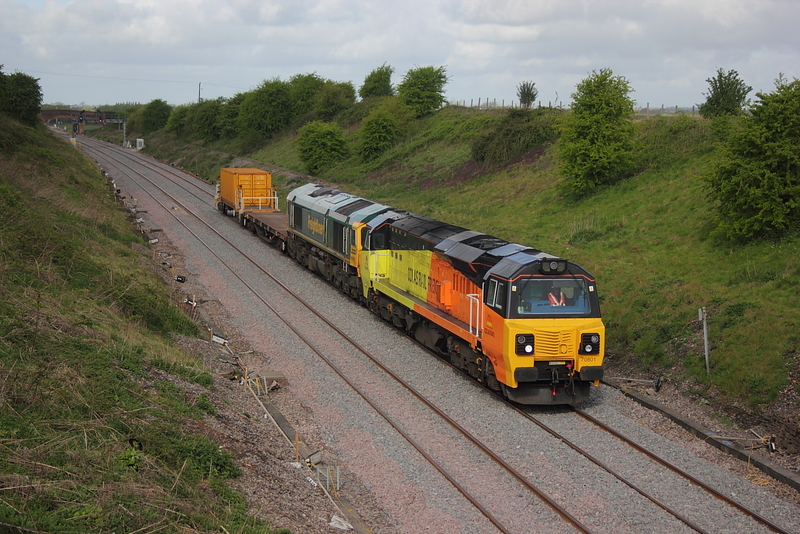 ​ 70804 6M50 Westbury to Bescot engineers. 70804 6Y42 Hoo Jnct. 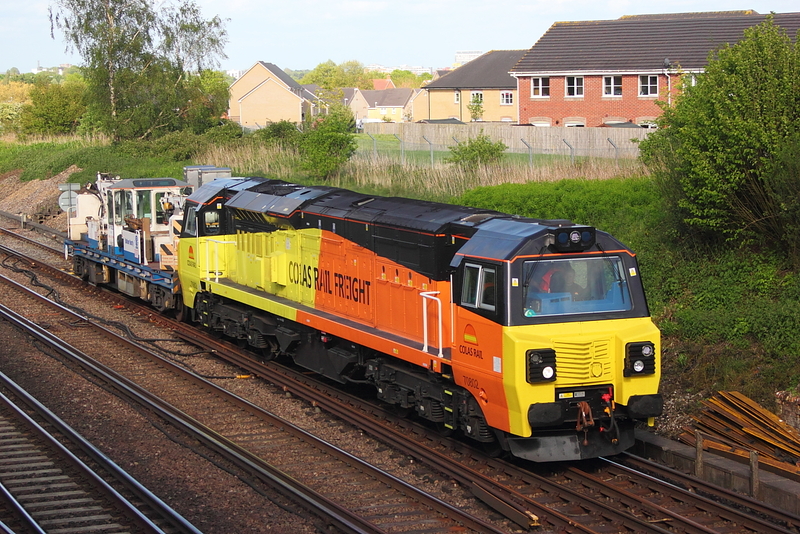 to Eastleigh East yard engineers. 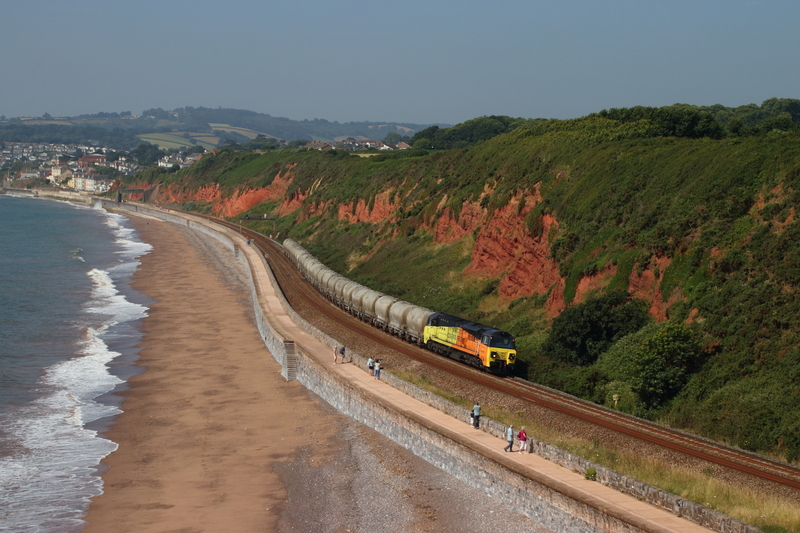 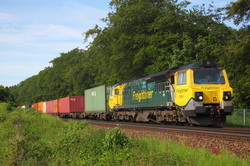 ​ 70006 4o70 Wentloog to Southampton liner. 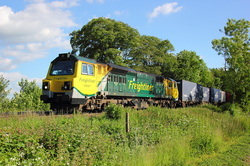 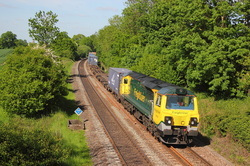 ​ 70813 6Y48 Eastleigh to Hoo Jnct. 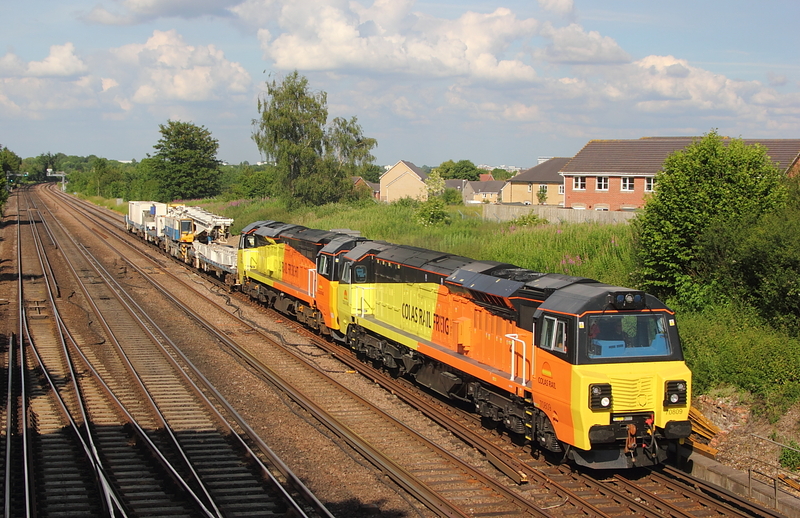 engineers. 70008 4M88 Felixtowe to Trafford Park liner. 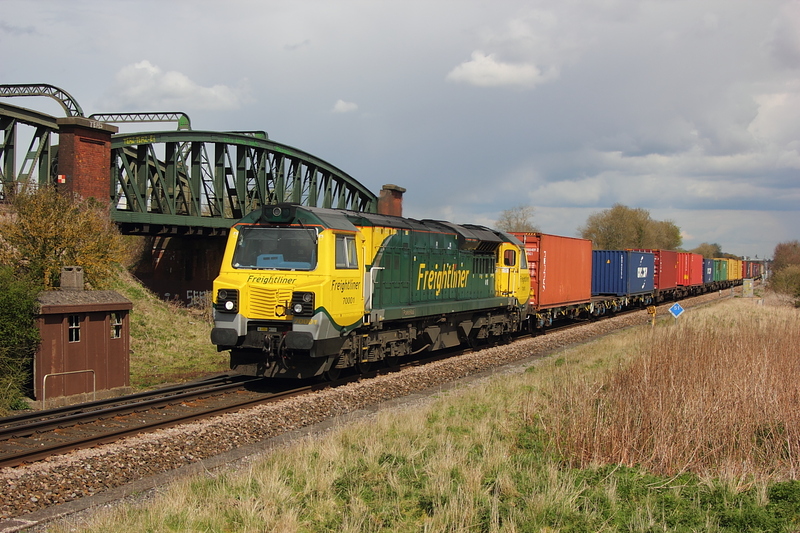 70019 Diverted 4M67 Felixtowe to Crewe liner. 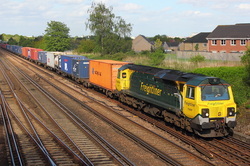 70007 4L84 Leeds to Ipswich yard liner. 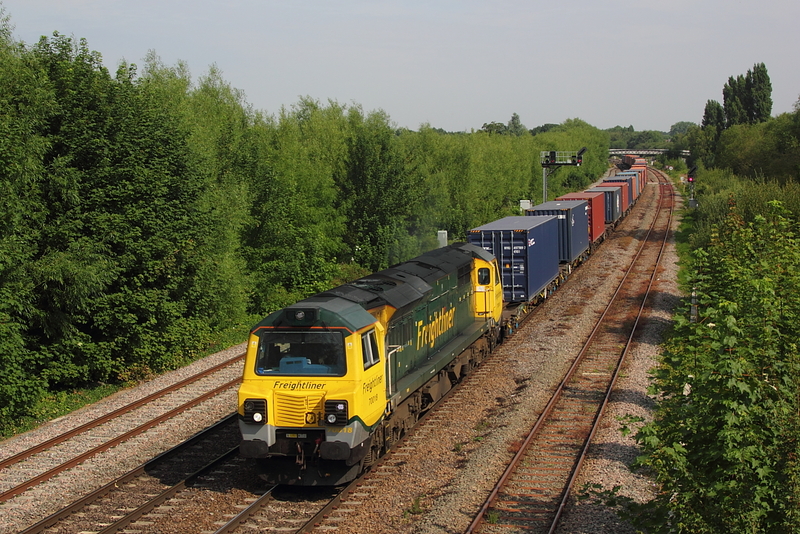 70008 on a diverted 4L97 Trafford Park to Felixtowe liner. 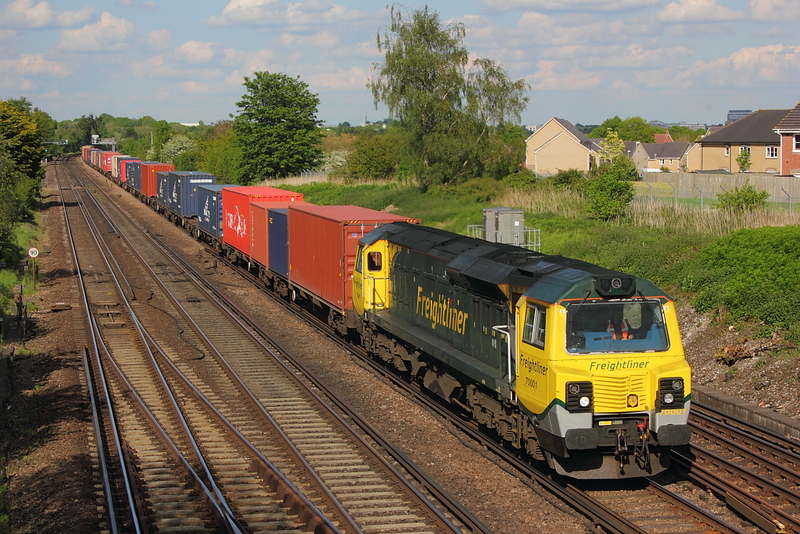 7004 arrives at Millbrook with a container move from Maritime,which in the past would have been a outbased 08/09 performing transfer duties. 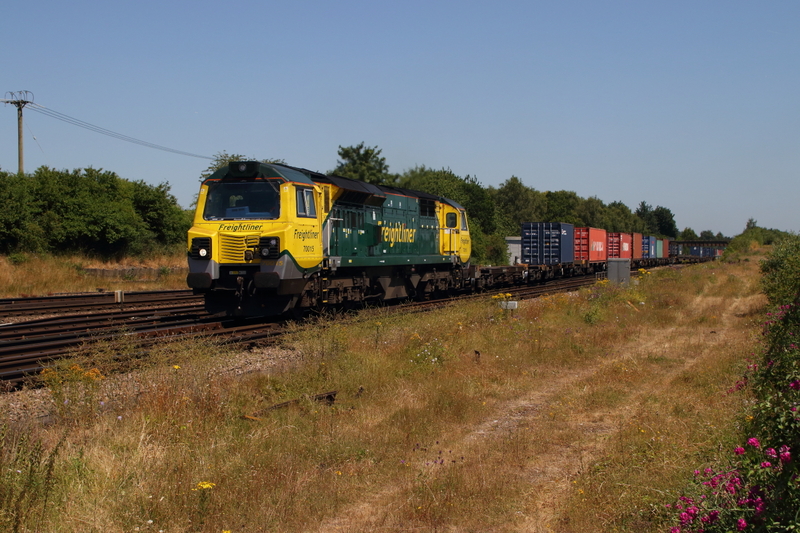 70807 6Y41 Eastleigh East yard to Hoo Jnct. 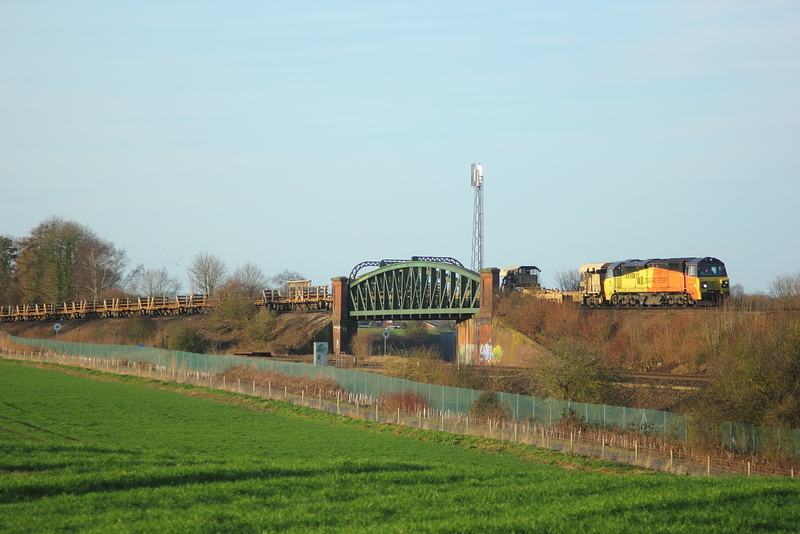 As I peered over the bridge confirming my fears that the sun angle had only just crossed the line,in sight was 70805 on 6Y42 Hoo jnct. 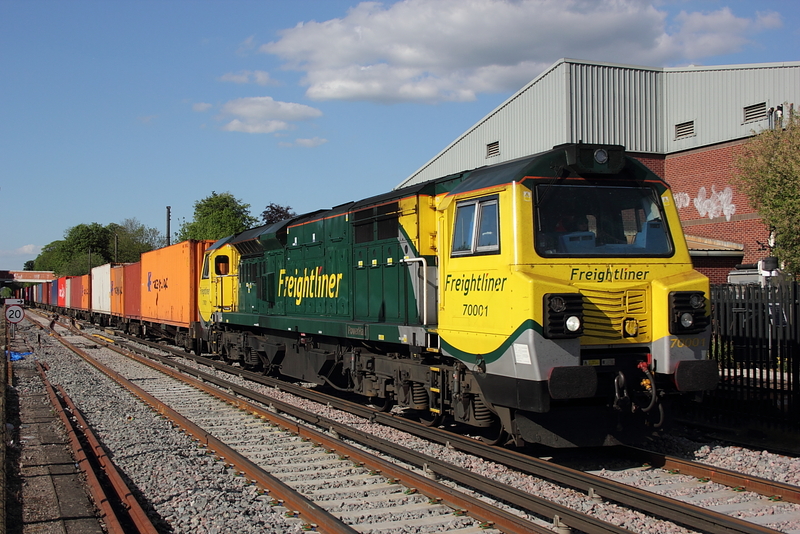 to Eastleigh East yard engineers. 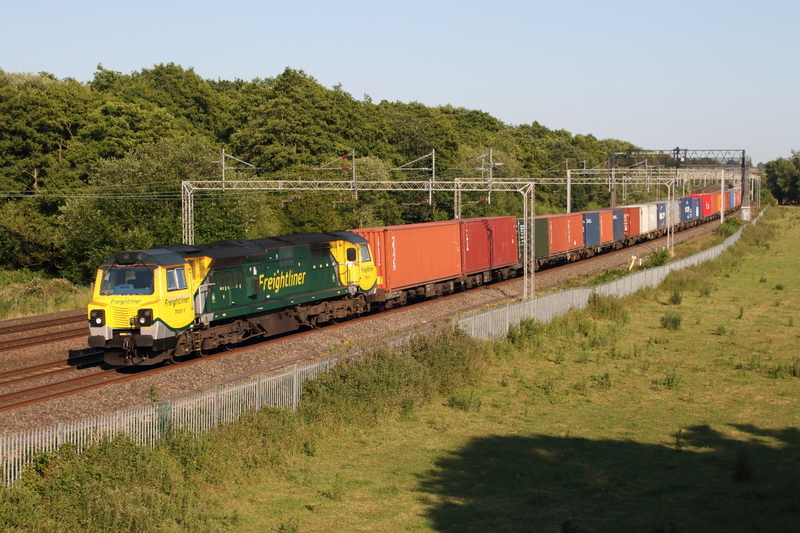 ,so it would be rude not to phot the damn thing. 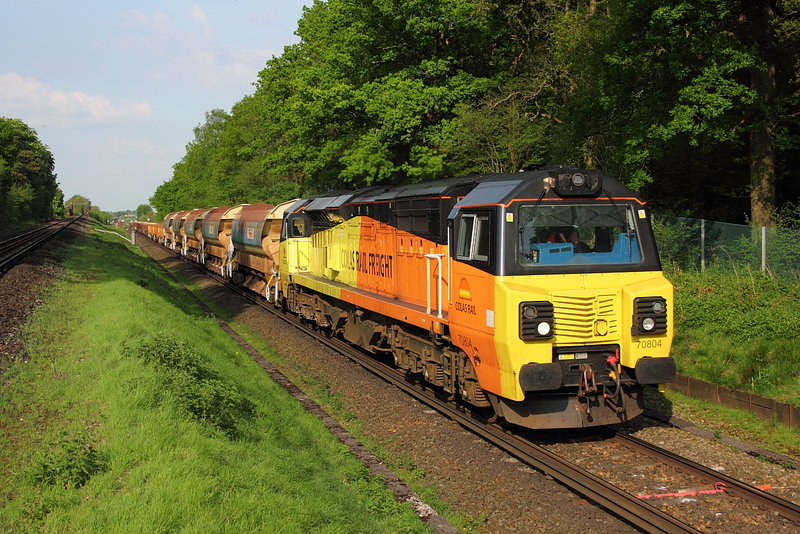 70013 approaches Wallers Ash loop on the later 4o51 Wentloog to Southampton path ,usually on Mondays due to no return working on the previous Saturday,alas empty behind loco. 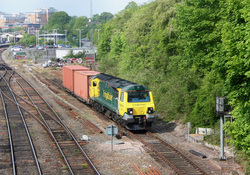 70008 4O70 Wentloog to Southampton liner. 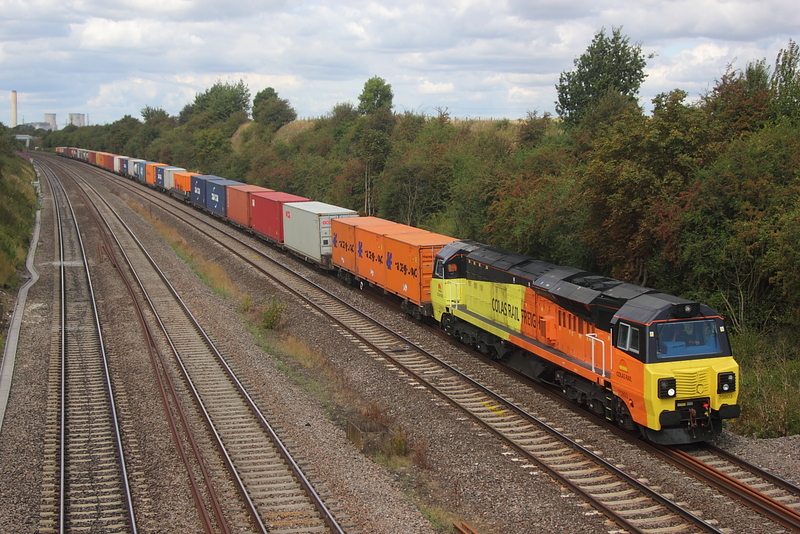 70810+GB 66719"Metroland "DIT slows for the booked stop in Wallers Ash loop on 6Y42 Hoo Jnct. 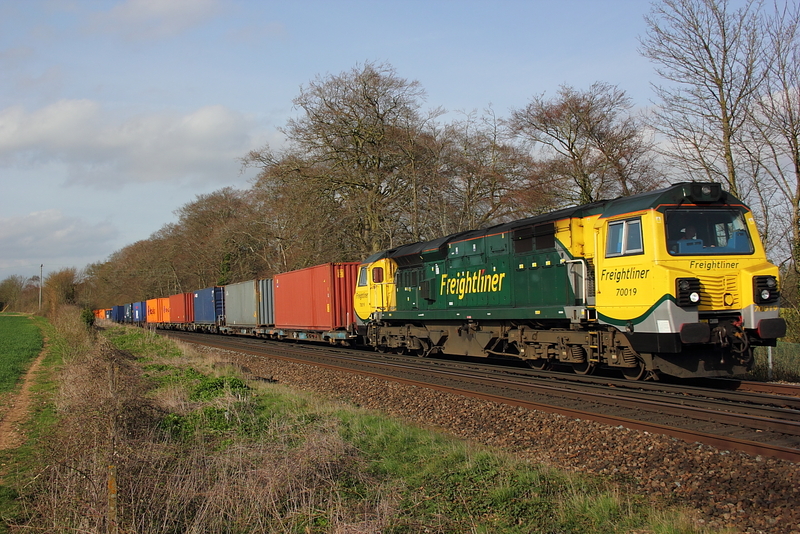 to Eastleigh East yard. 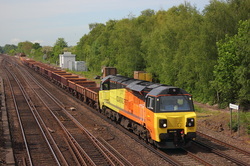 70810 6Y42 Hoo Jnct. 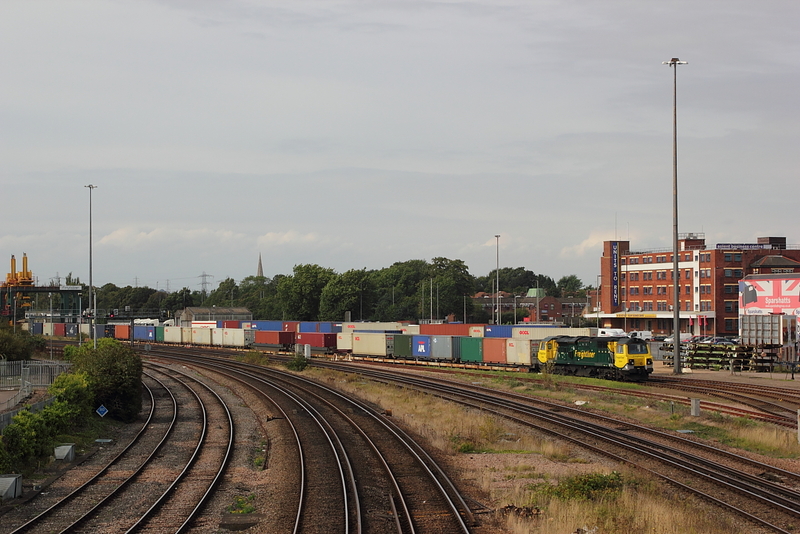 to Eastleigh East yard. 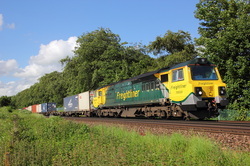 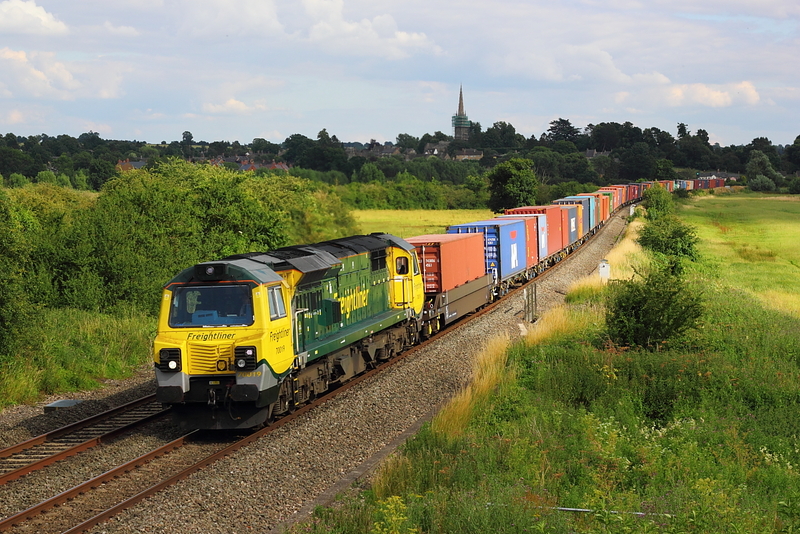 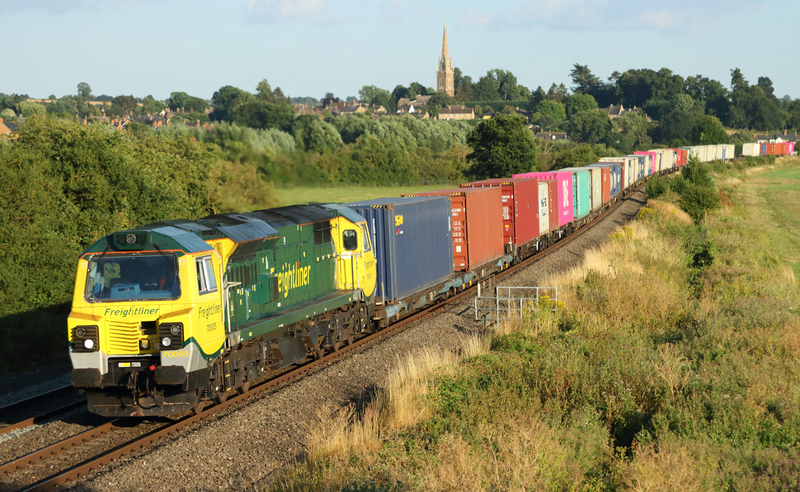 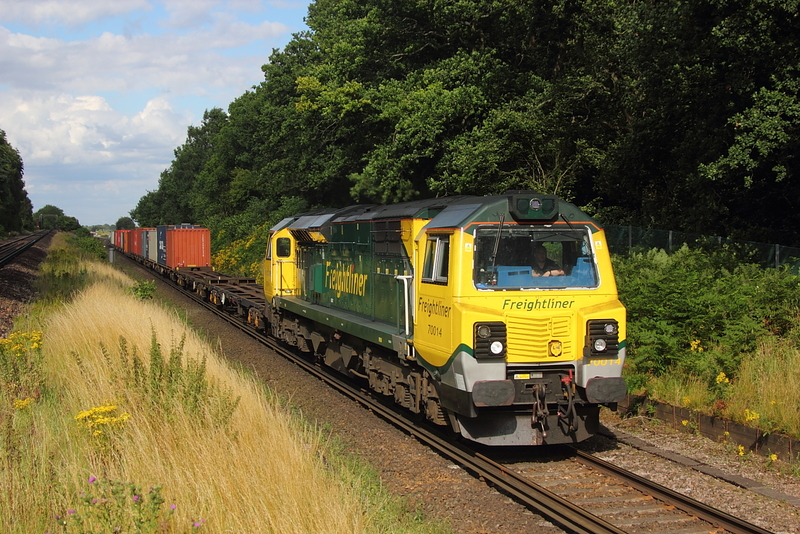 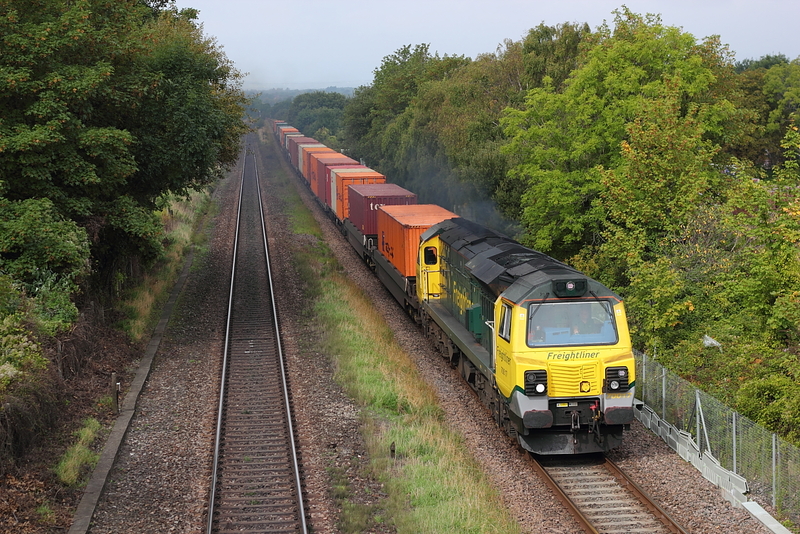 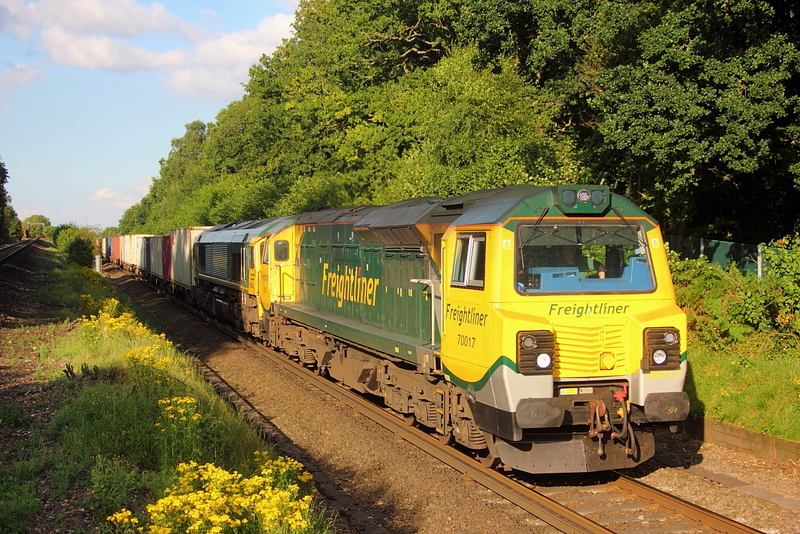 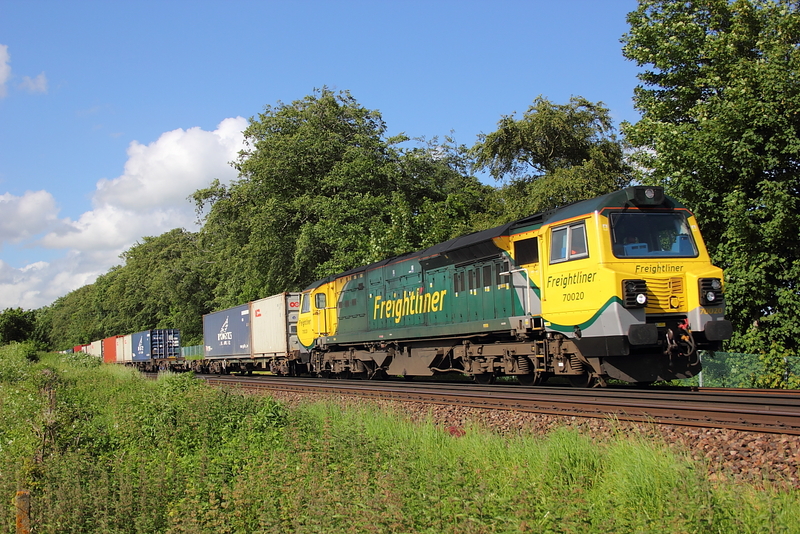 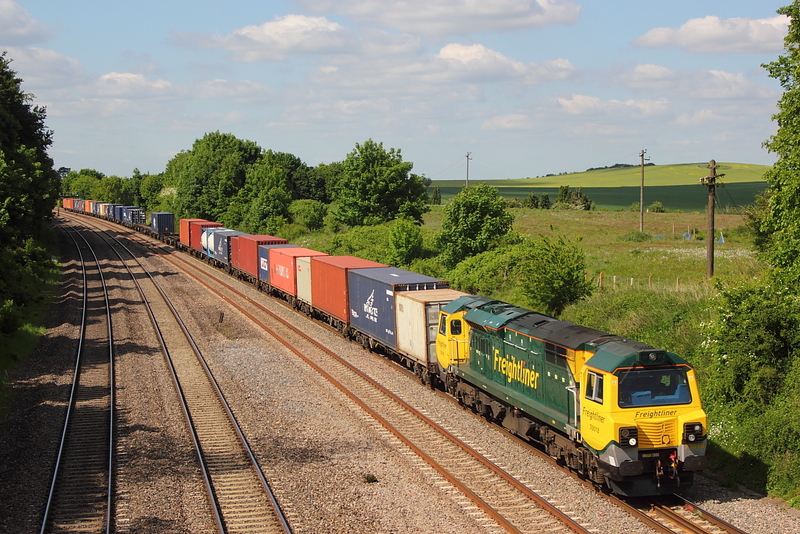 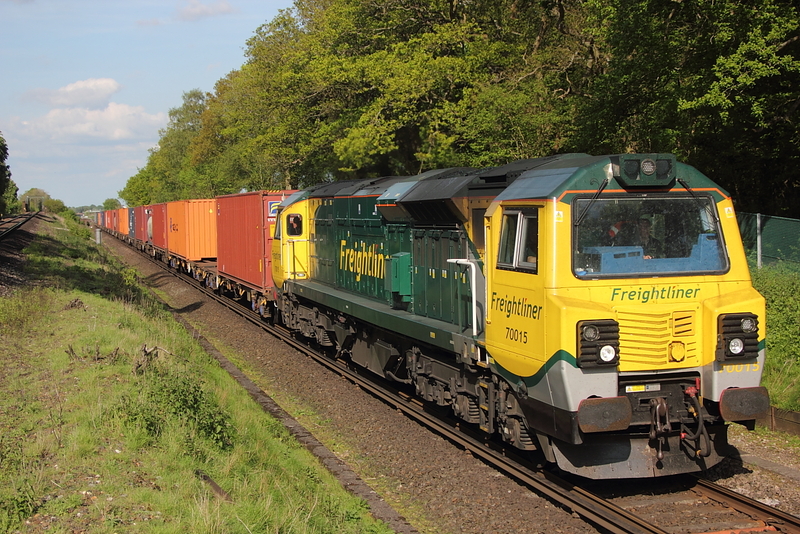 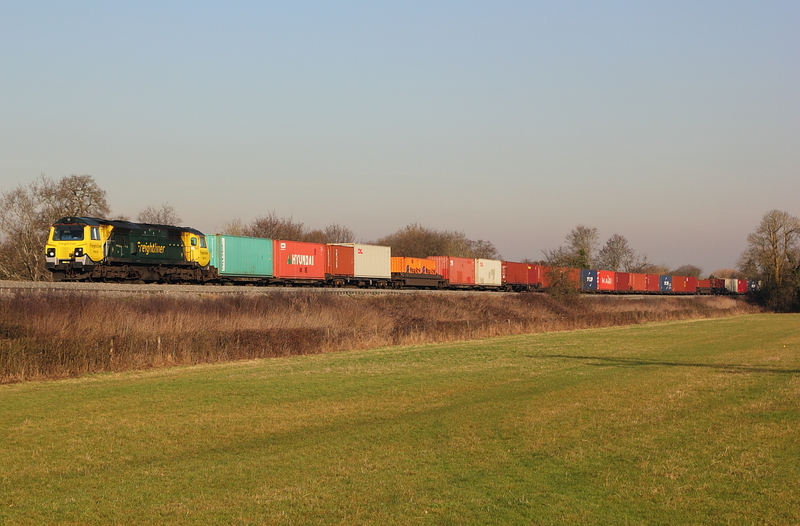 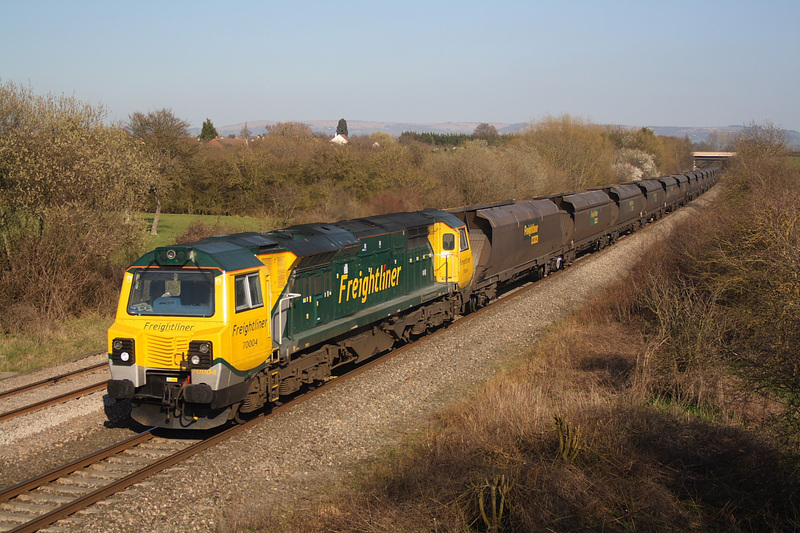 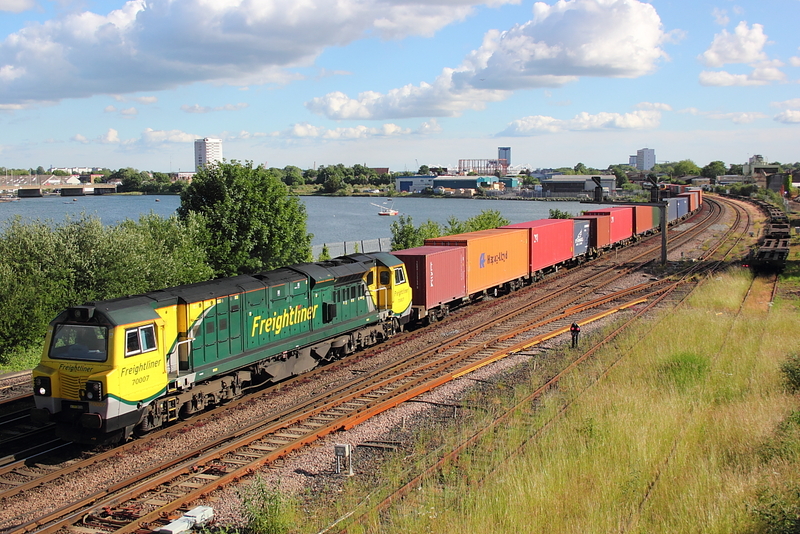 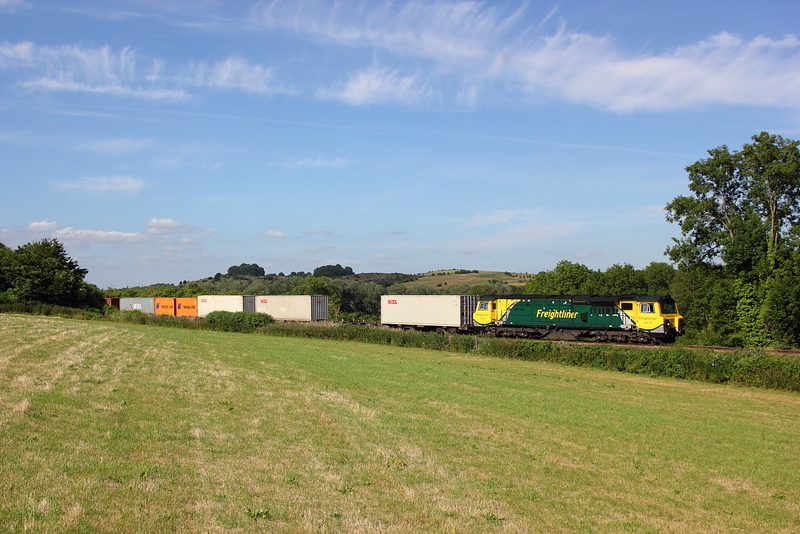 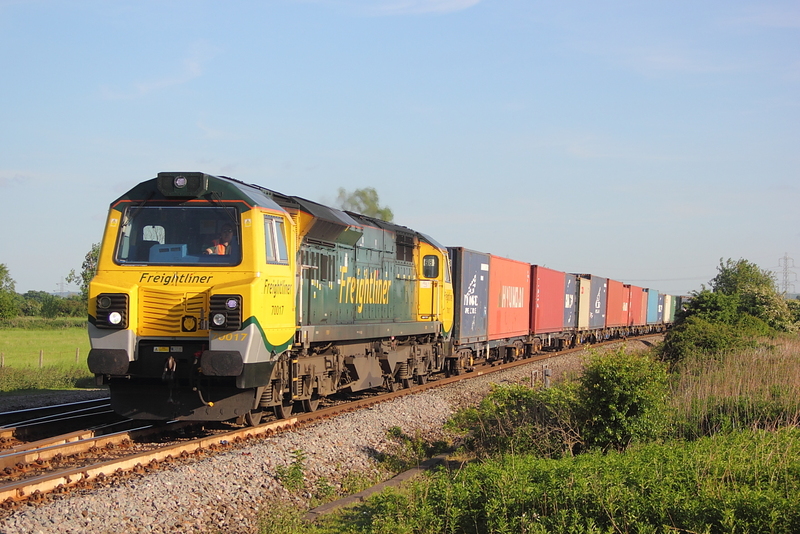 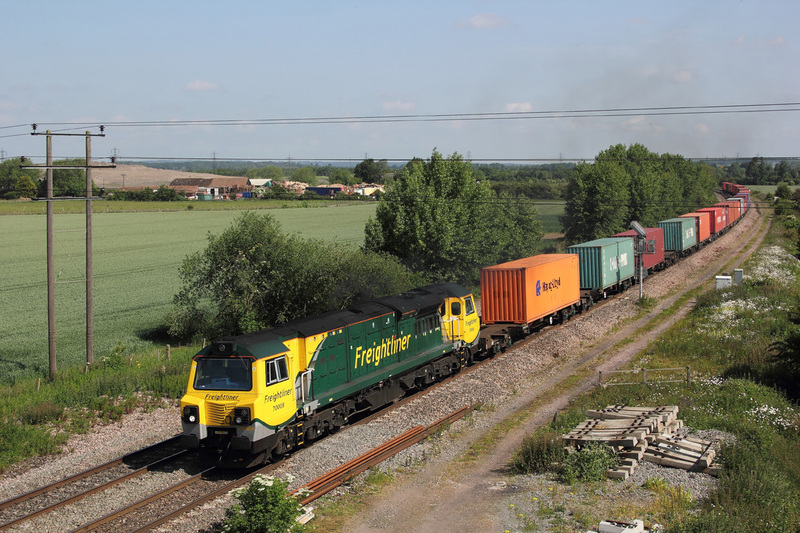 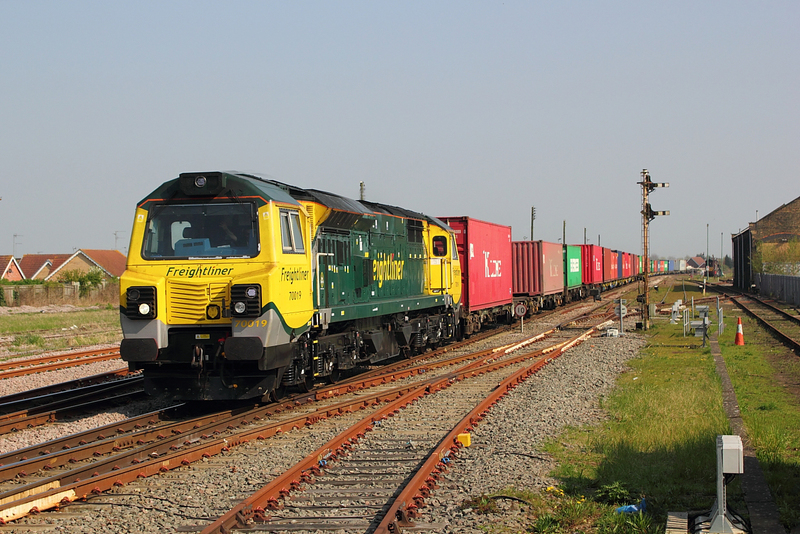 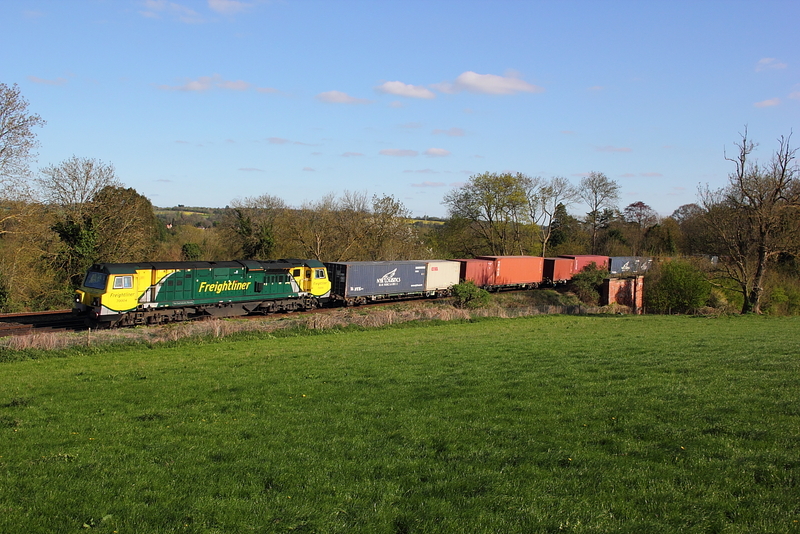 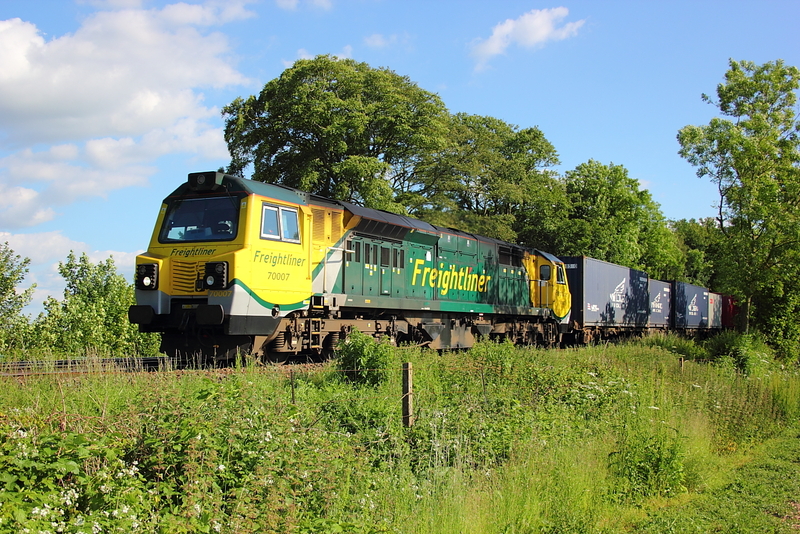 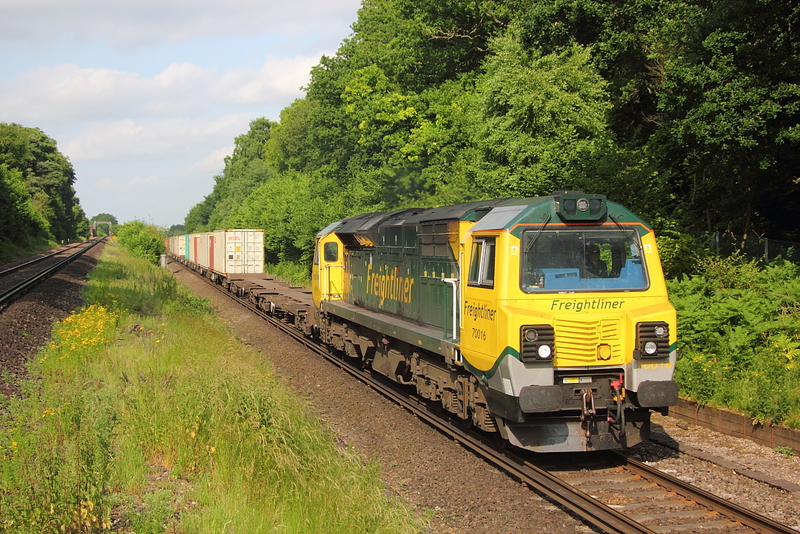 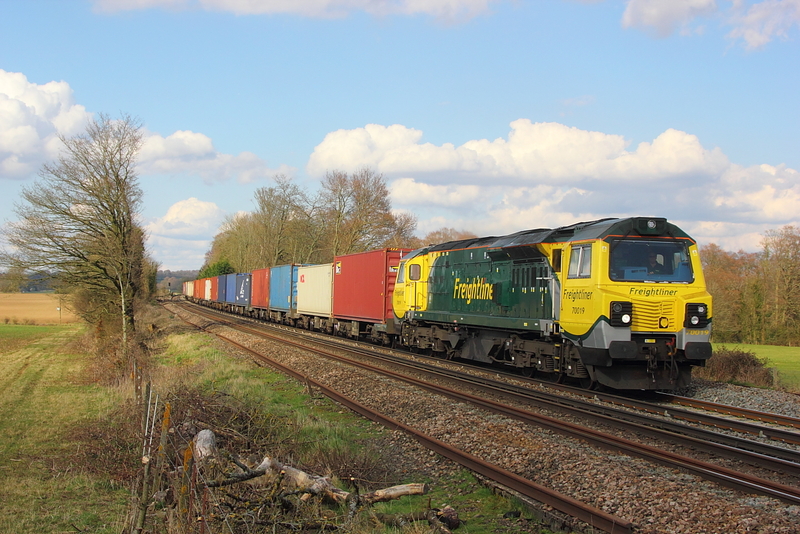 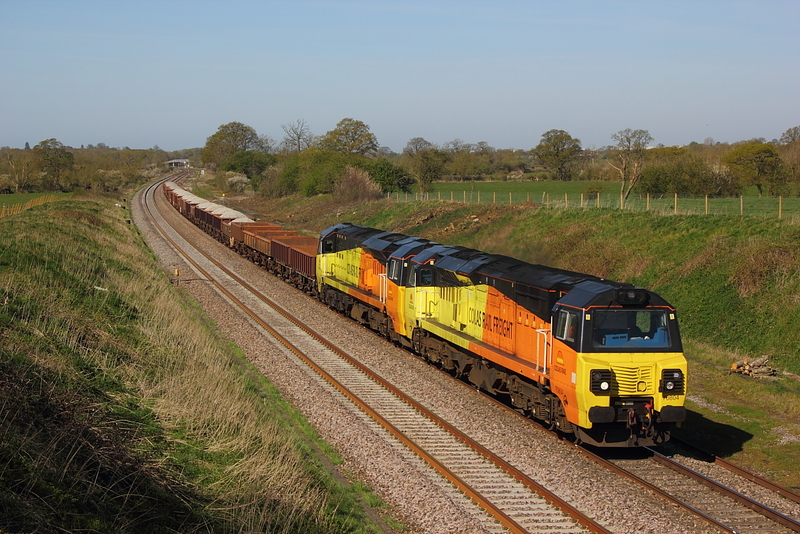 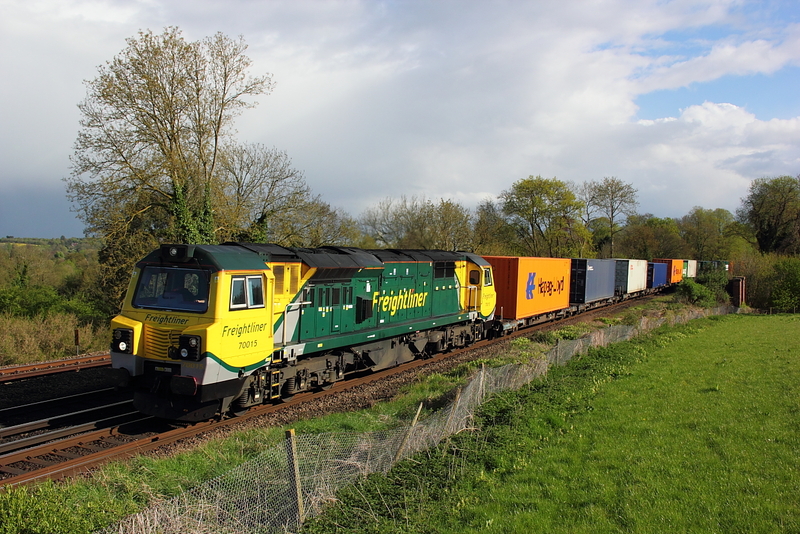 Having lost the 3 previous freights to cloud despite standing under sunny sky for at least half an hour beforehand,the final one came good as the encroaching cloud held off long enough as 70806 passed on 6Y42 Hoo Jnct. 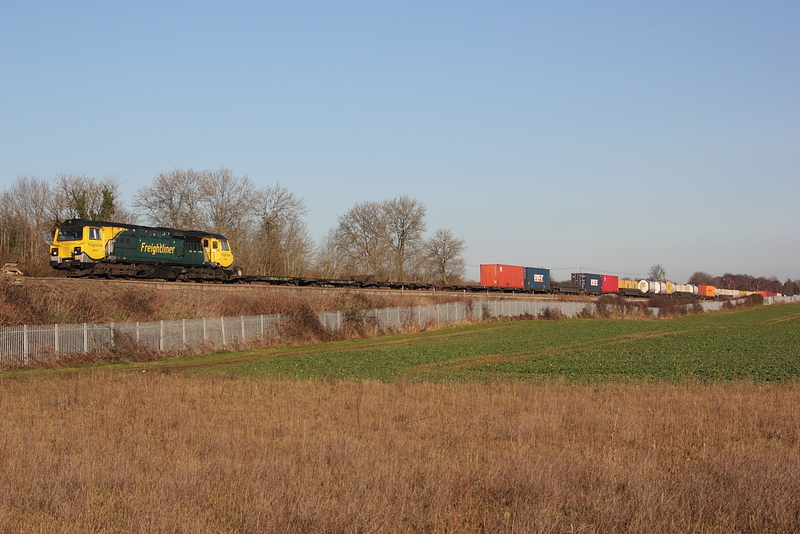 to Eastleigh East yard. 70013 4O70 Wentloog to Southampton liner. 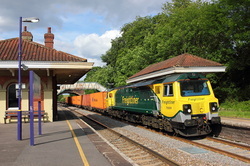 70017 4O70 Wentloog to Southampton liner. 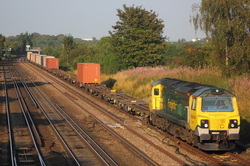 70017 4O54 Leeds to Southampton liner. 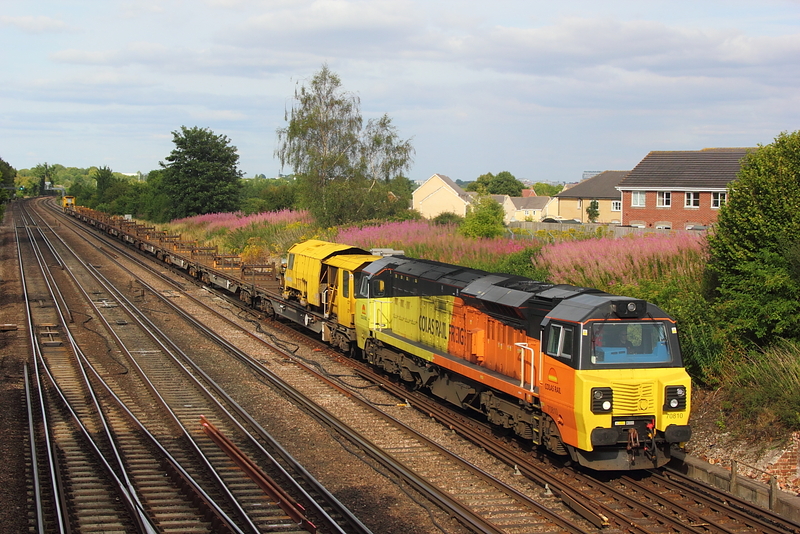 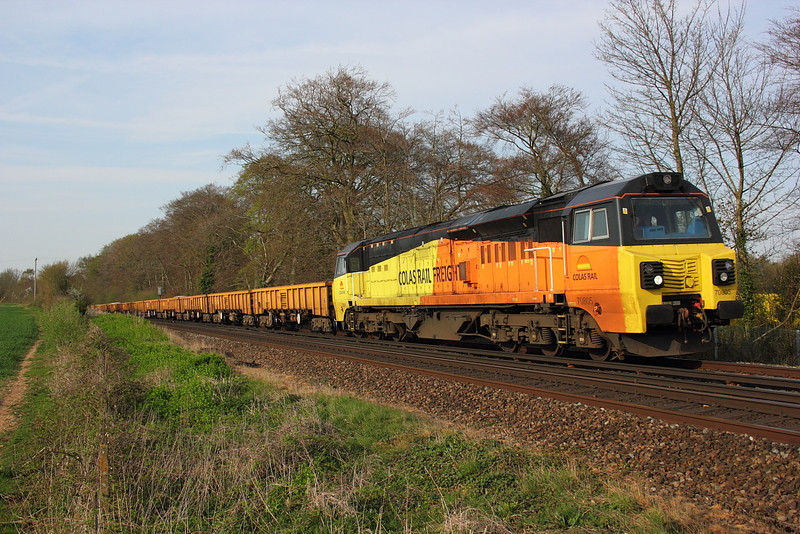 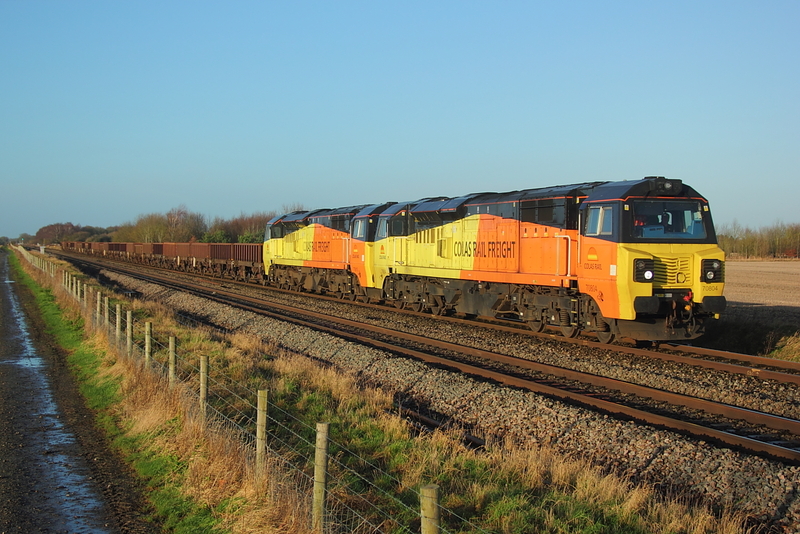 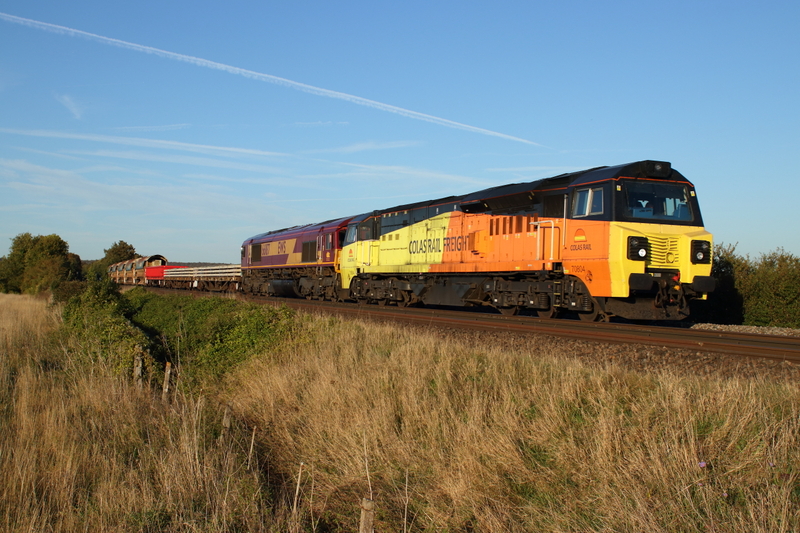 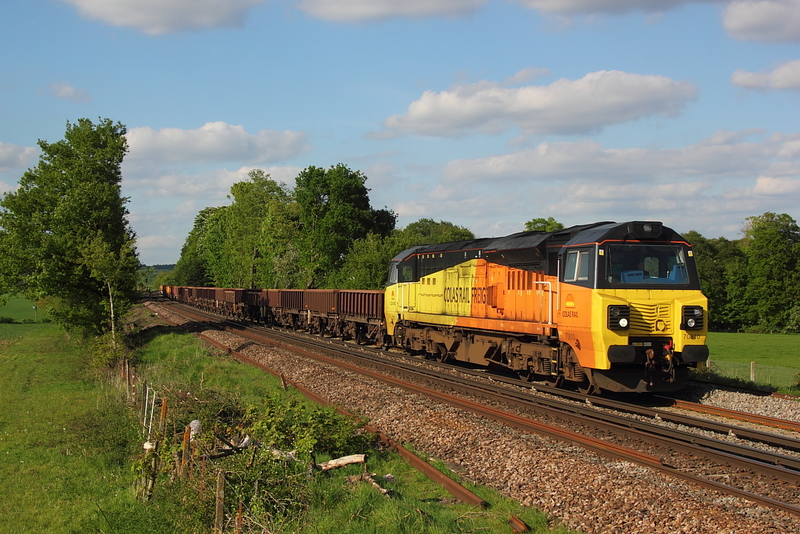 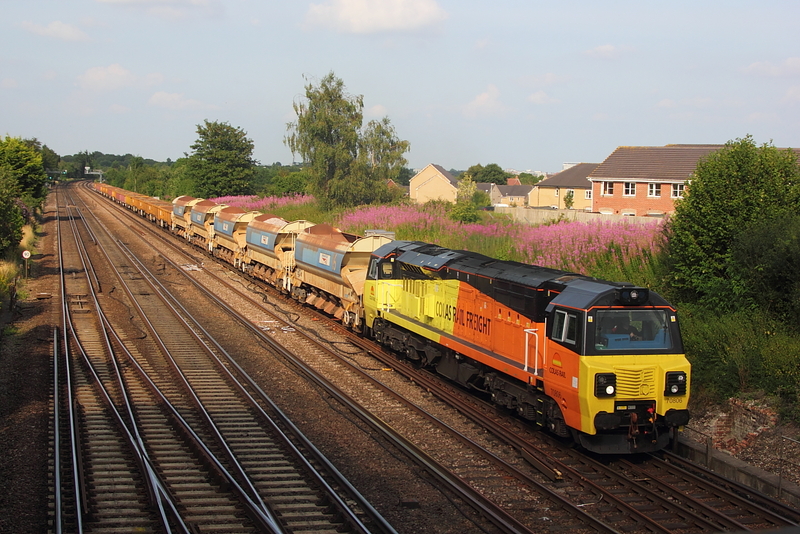 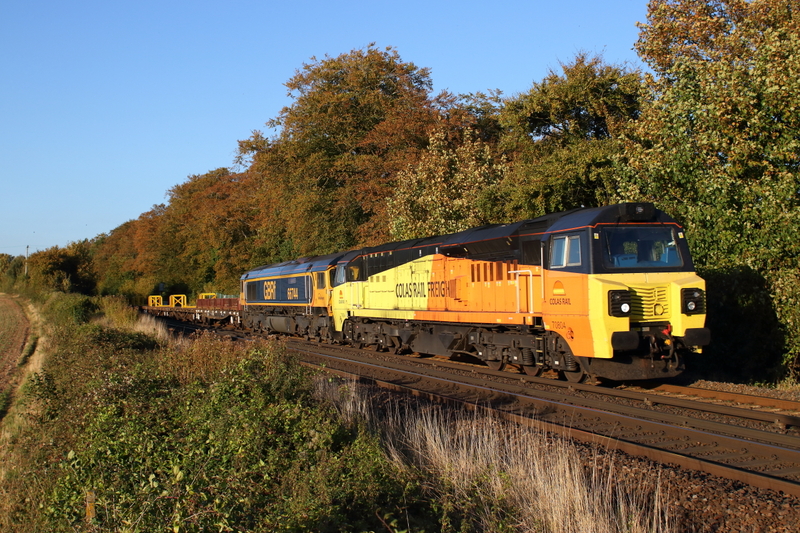 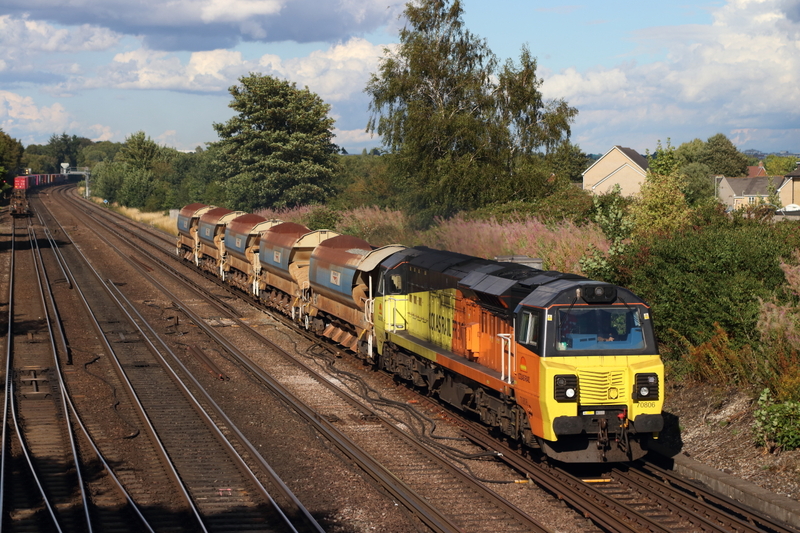 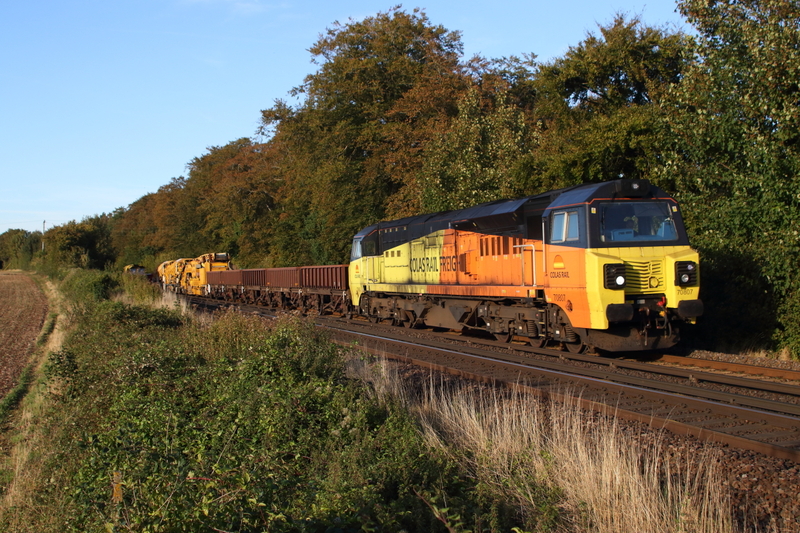 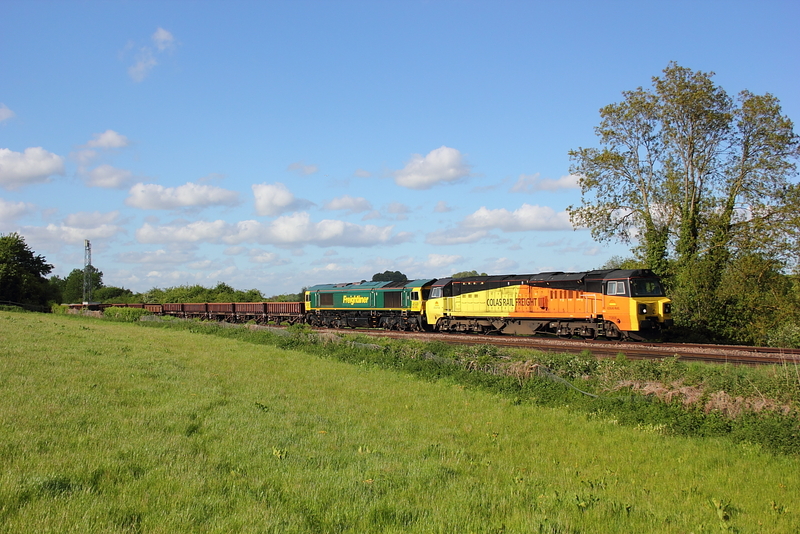 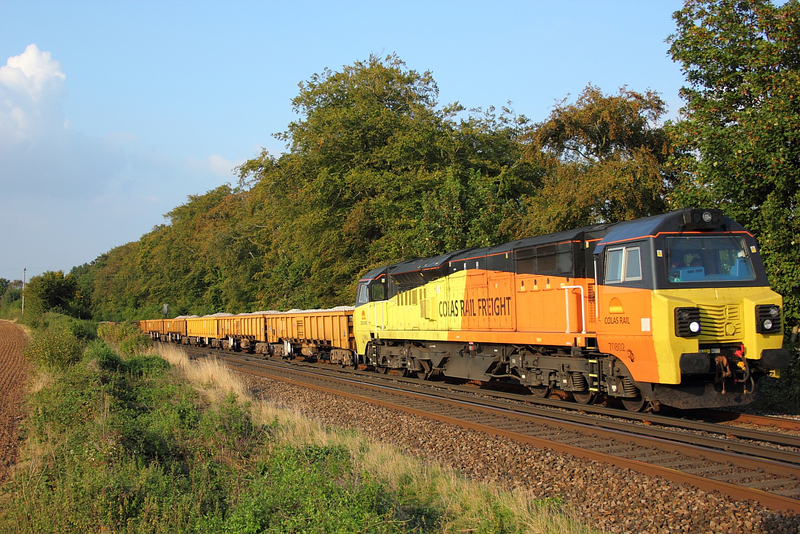 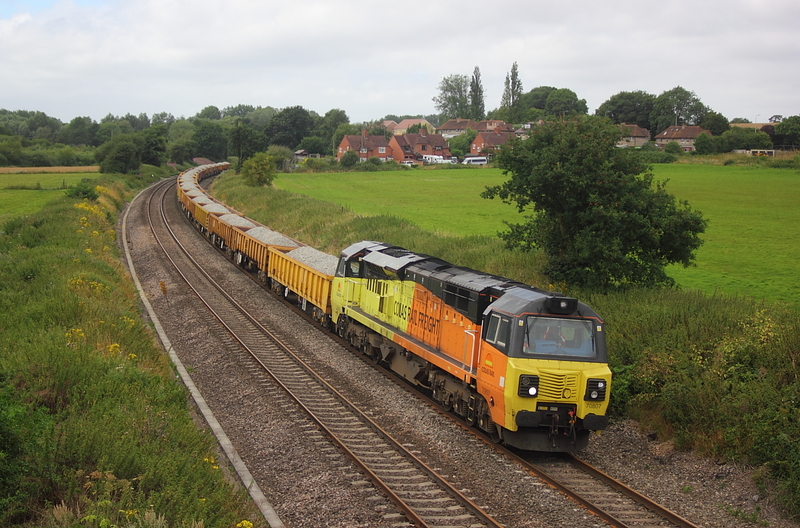 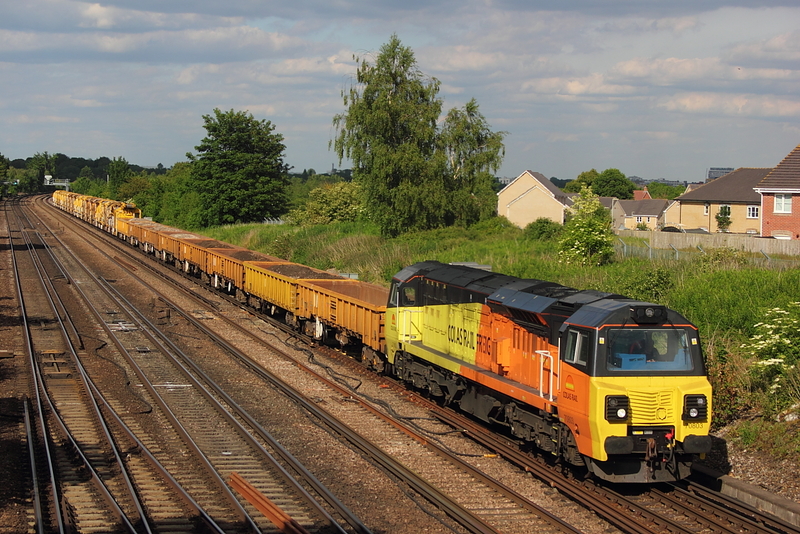 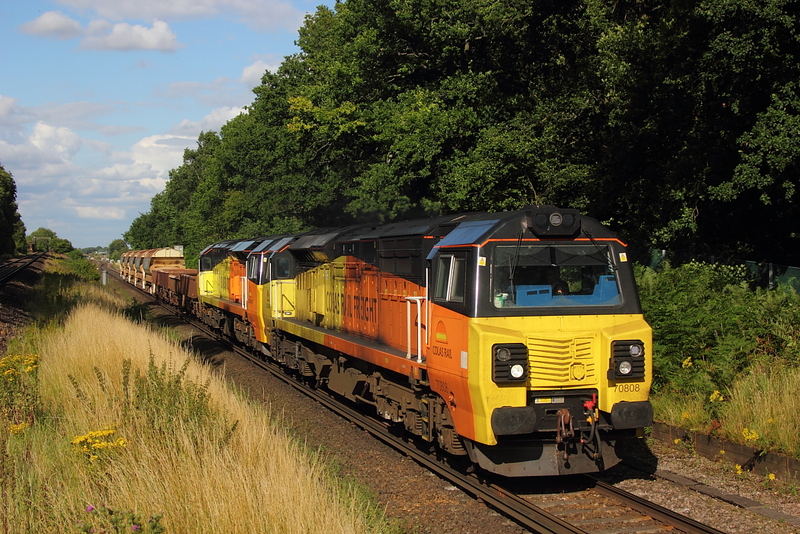 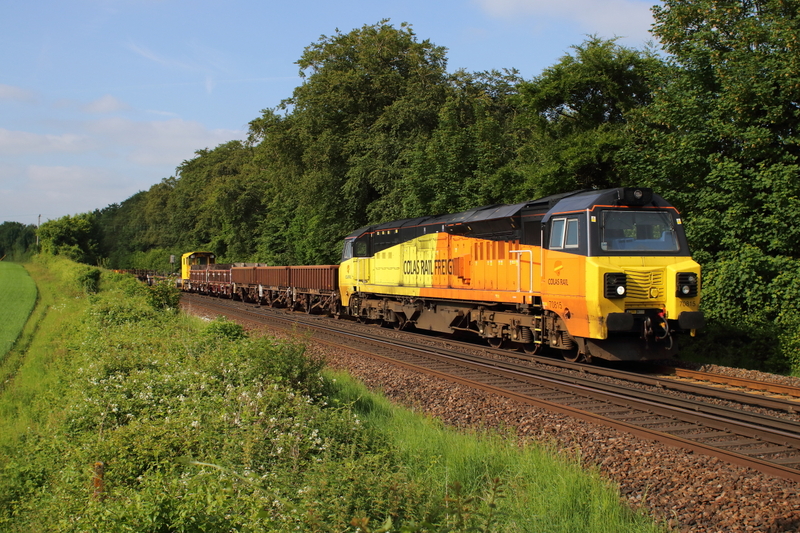 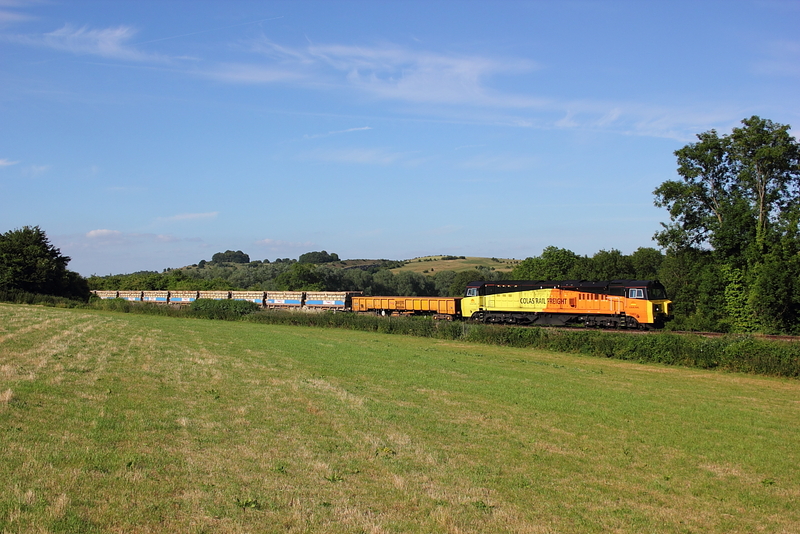 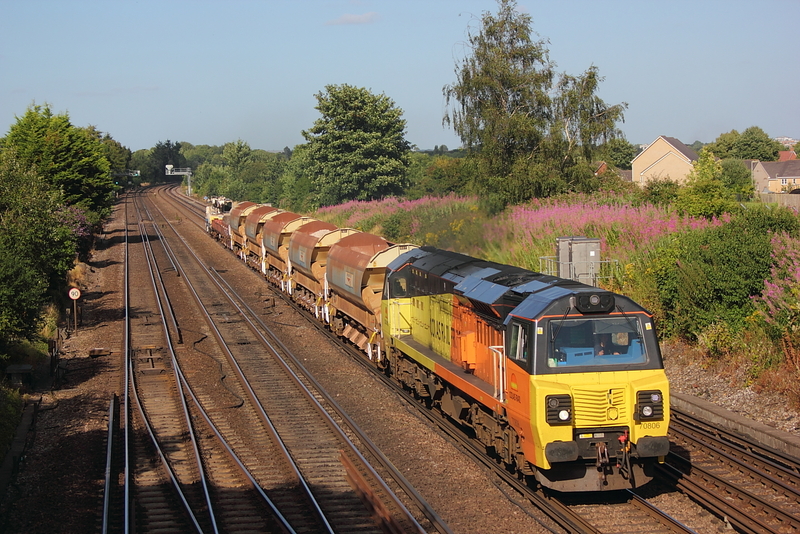 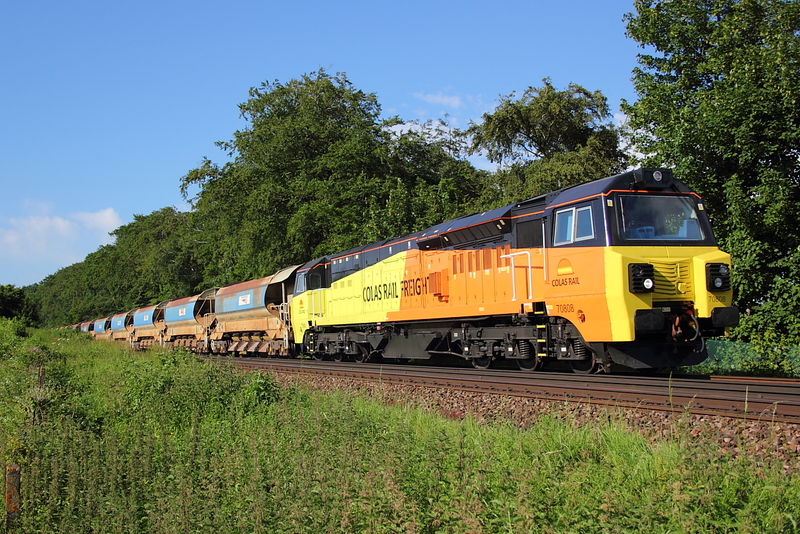 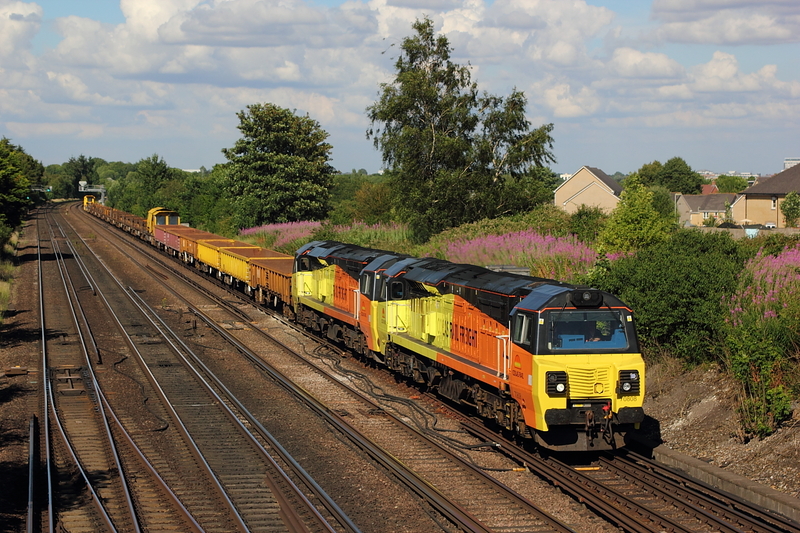 Colas pairing off 70804+70810 pass Steventon with the last 6M50 Westbury to Bescot off the year. 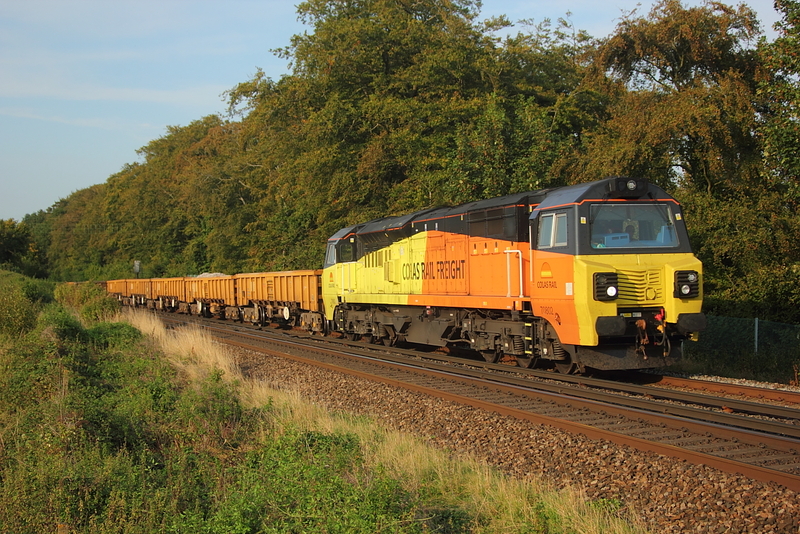 70011+70013 DIT 4O09 Crewe Basford Hall to Southampton liner. 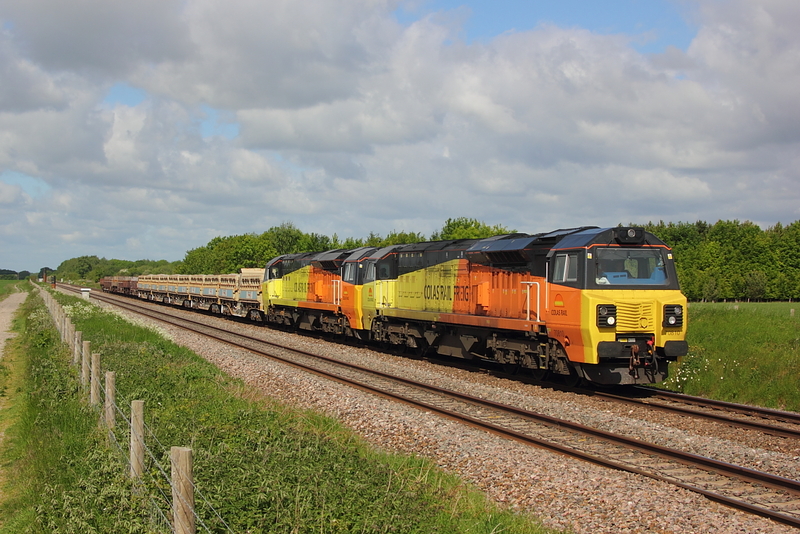 After a long walk this shot of 70802Top and 70807 Tailing on 6C22 17.28 Westbury to Largin would ave made up for a quiet afternoon,alas the non appearance of the sun scuppered that...even the cows had buggered off. 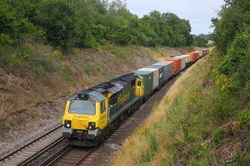 70002 4O09 Crewe Basford Hall to Southampton liner. 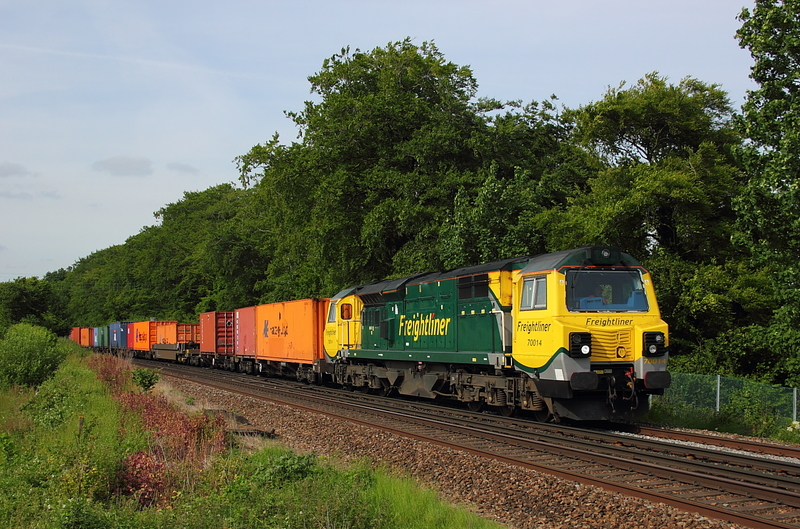 70019 pulls away from the Eastleigh crew change ,heading the short distance to the container port at Southampton with 4o27 from Garston. 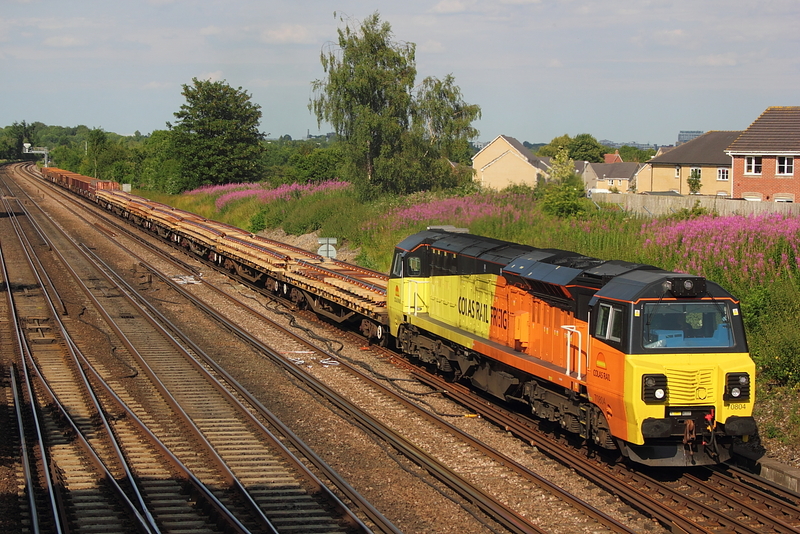 70019 4O27 Garston to Southampton liner. 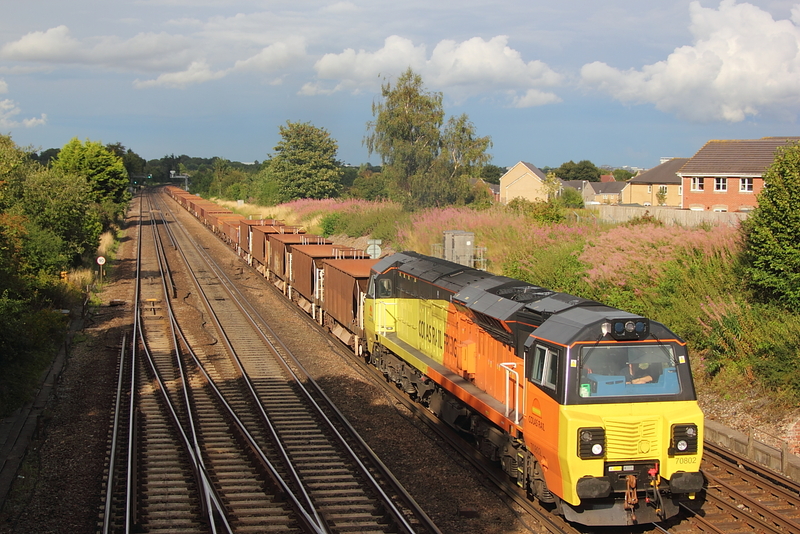 70810 6O31 Westbury to Eastleigh,passes a dull St. Denys,thanks to a rogue cloud. 70808+70801 DIT 6Y42 Hoo Jnct. 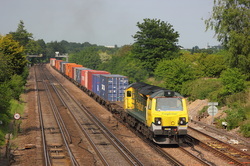 to Eastleigh East yard. 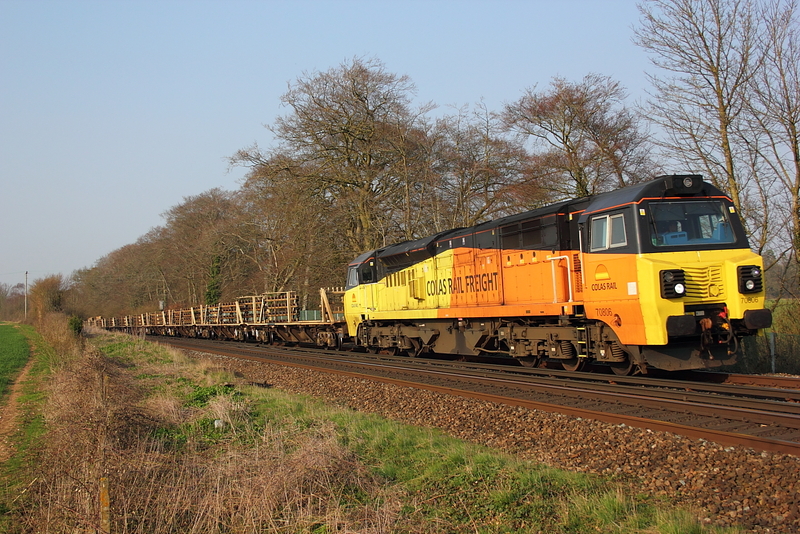 70014 4O09 Crewe Basford Hall to Southampton liner. 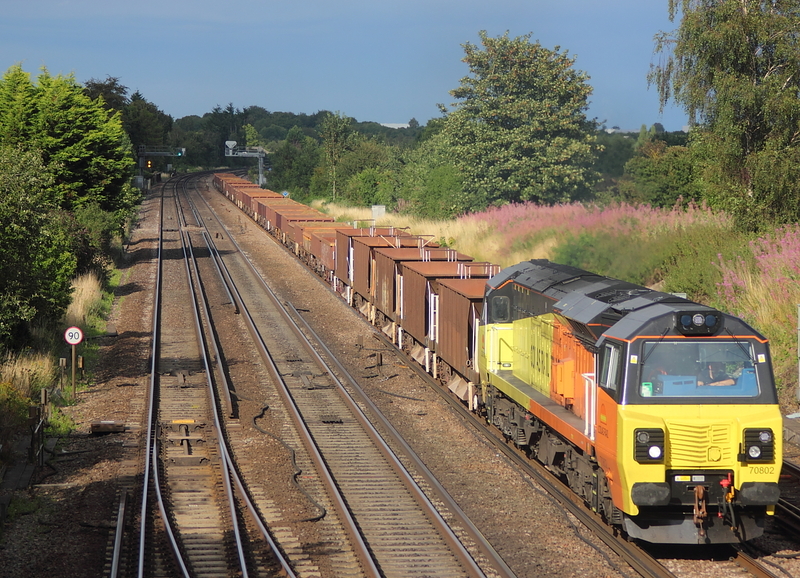 With 70801 on 6031 Westbury to Eastleigh ,running 3 minutes early at this point coincided with the only sodding cloud for nearly an hour,and to make matters worse a few minutes later, if it had been on time would have been under sunny conditions.This bloody pastime can be cruel at times. 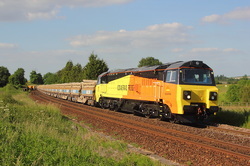 70008 4O09 Crewe Basford Hall to Eastleigh East yard liner. 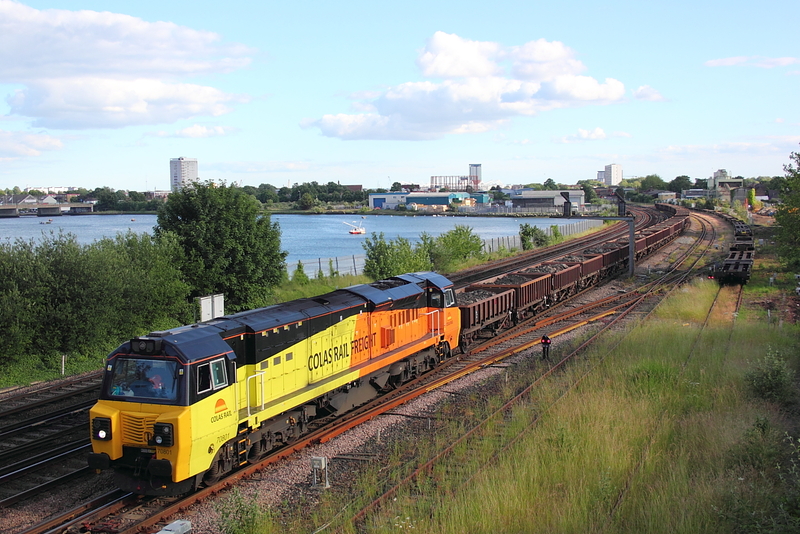 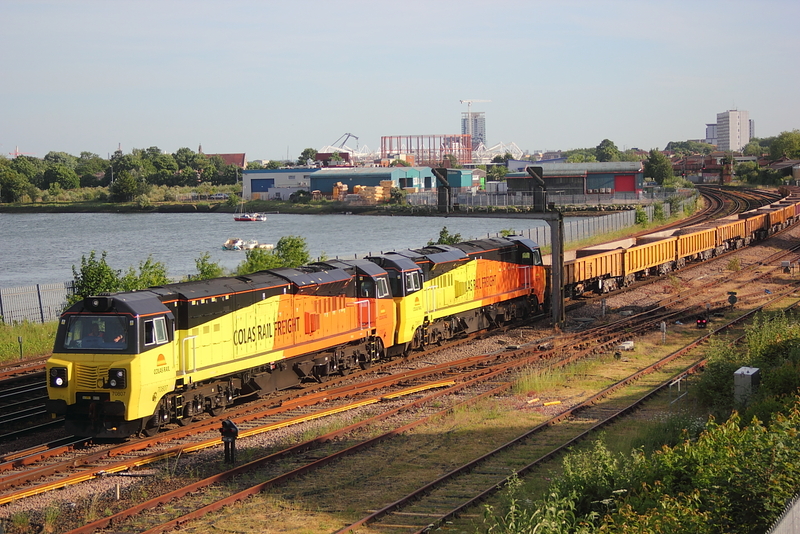 The one member off the Colas class 70 fleet,i have not been able to get a shot off,is 803,until tonight that is,when finally it appears ,passing Worting Jnct.on 6Y42 Hoo Jnct. 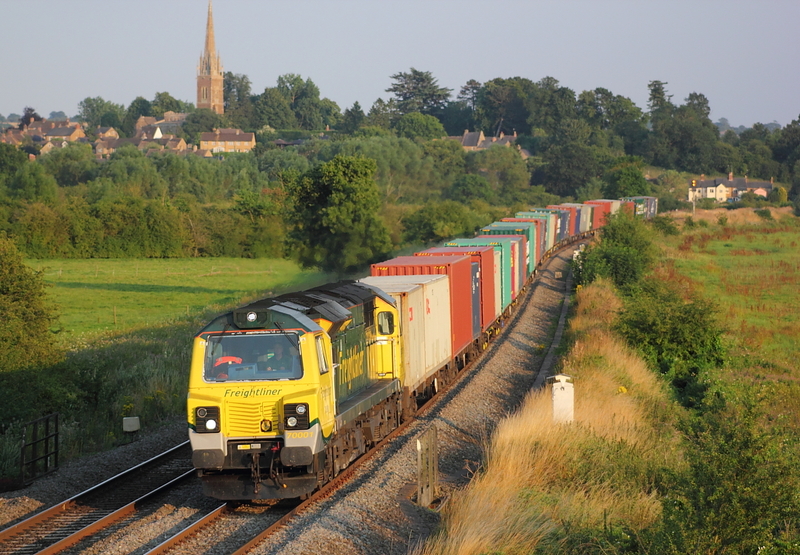 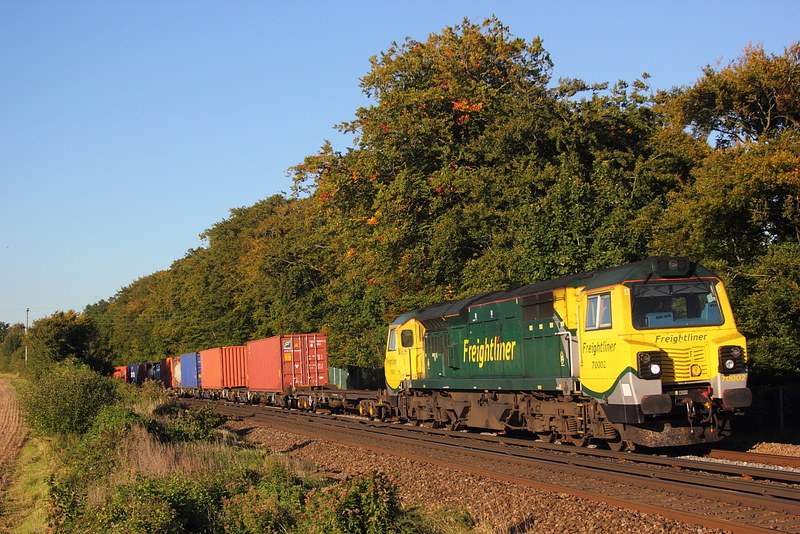 to Eastleigh East yard in some welcome evening sunshine. 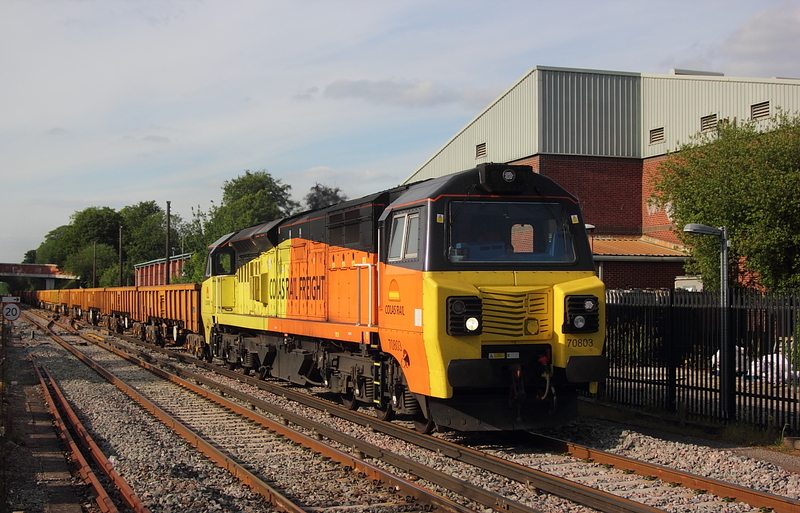 70019 4O09 Crewe Basford Hall to Southampton liner. 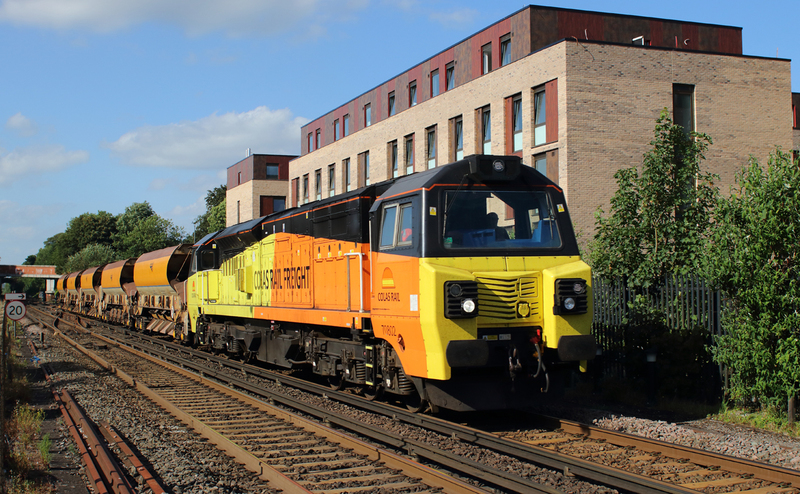 70015 4O09 Crewe Basford Hall to Southampton liner. 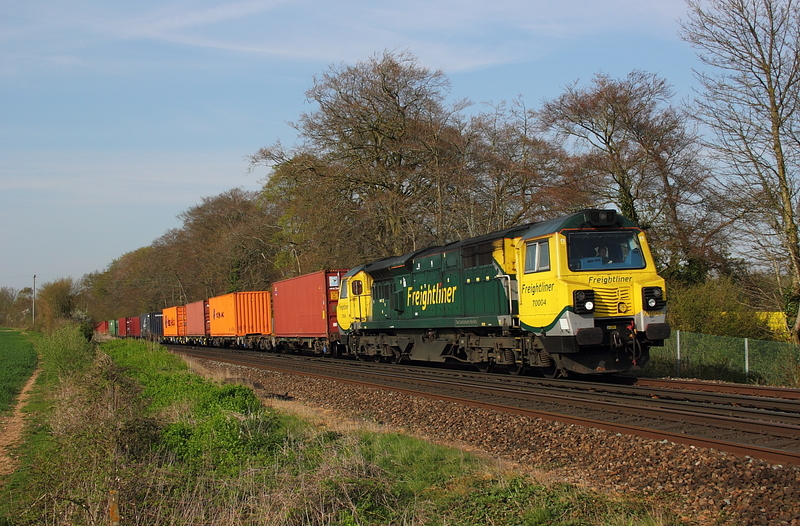 70019 4M99 Southampton to Trafford Park liner. 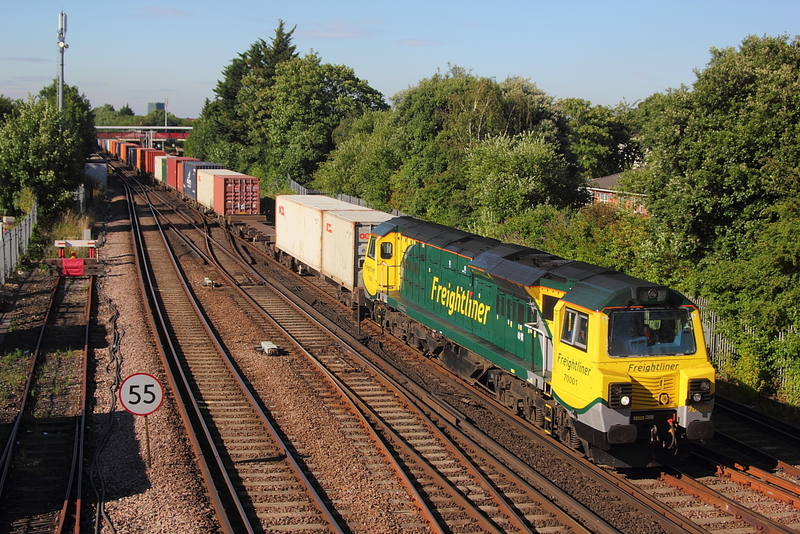 Despite looking like a sunny evening,if you were to look in the opposite direction,it was unbroken cloud,apart from this last small gap...good job it missed its Waller Ash booked stop. 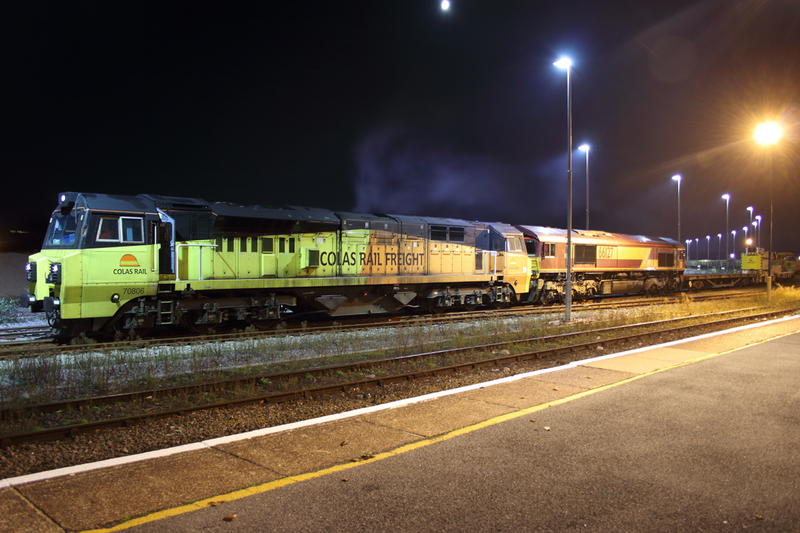 Under a milky sky,70004 passes Winchester on 4O09 Crewe Basford Hall to Southampton liner. 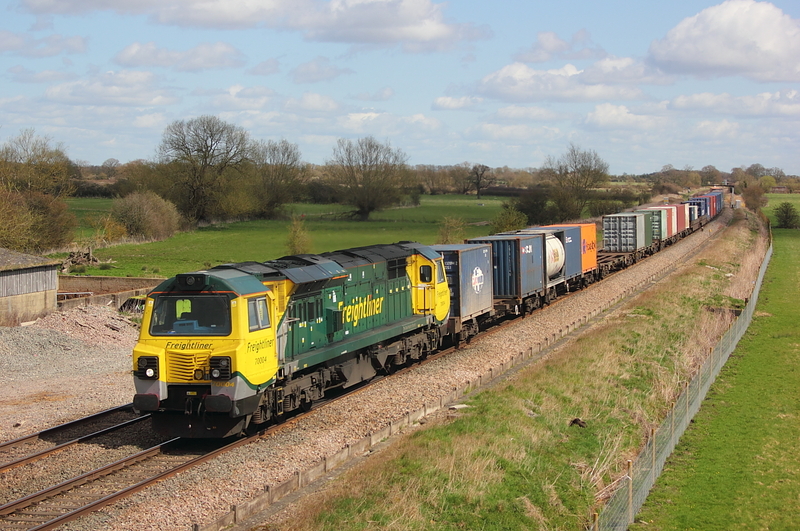 The morning rapid cloud build up ,put paid to a sunny Bank Holiday 6M50,but with only 66952 and a sparce load ,70801's engine must have been on tickover as it passed by at Bourton. 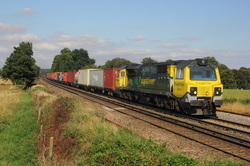 70810 6Y42 Hoo Jnct.to Eastleigh East yard. 70008 4O09 Crewe Basford Hall to Southampton liner. 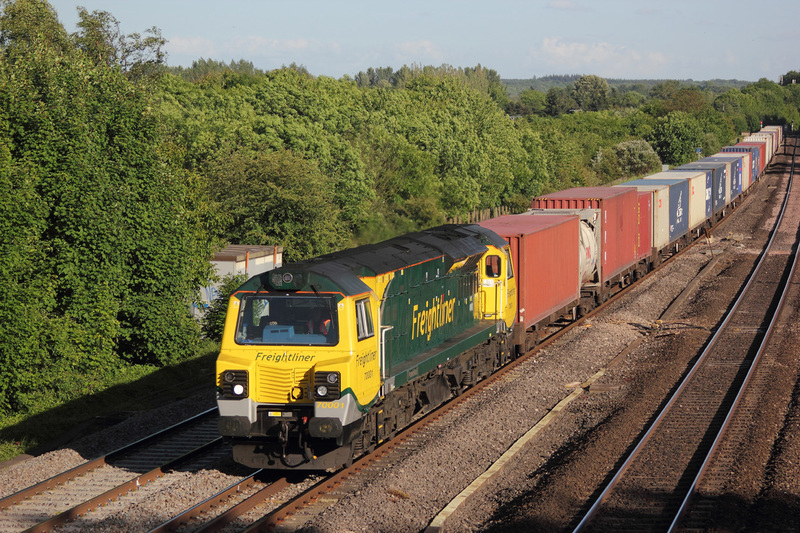 70015 4M99 Southampton to Trafford Park liner. 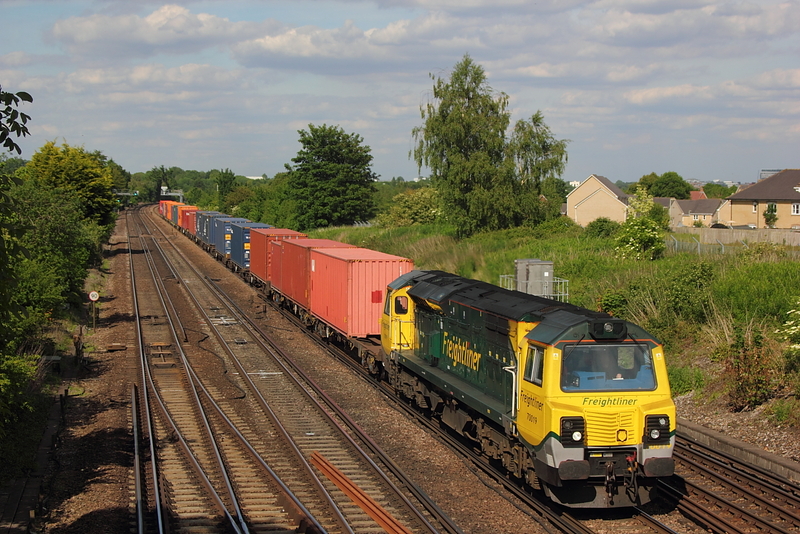 70004+66591 DIT 4O09 Crewe Basford Hall to Southampton liner. 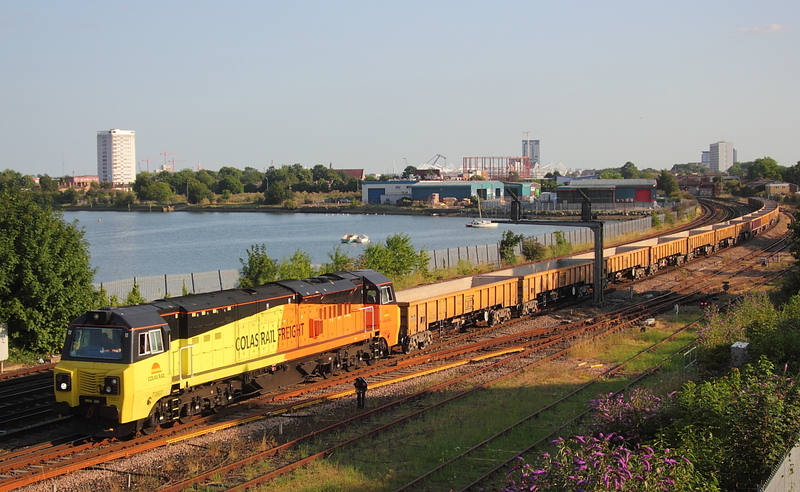 Lucky with a bit of milky sun but unlucky with the load....70003 4O09 Crewe Basford Hall to Southampton liner. 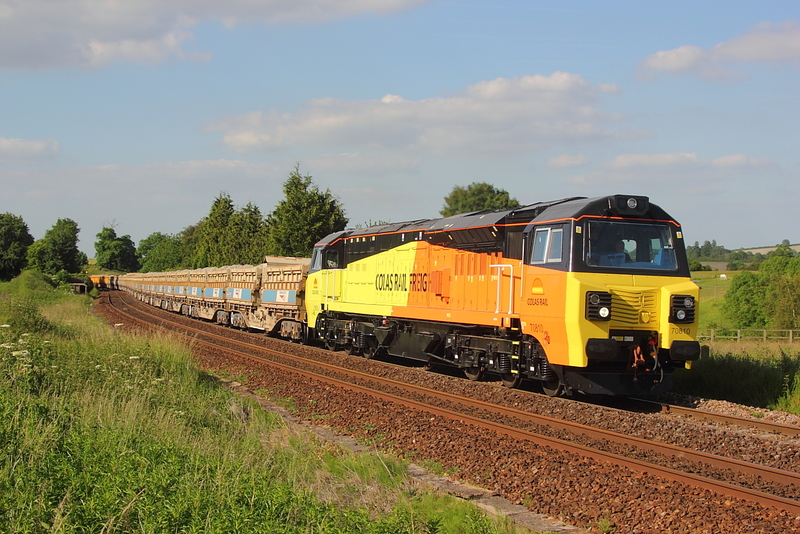 Wider angle than last night,but at least theres no empties behind the loco....70001 passes on 4O09 Crewe Basford Hall to Southampton liner. 70806 6Y42 Hoo to Eastleigh East yard. 70001 4O09 Crewe Basford Hall to Southampton liner. 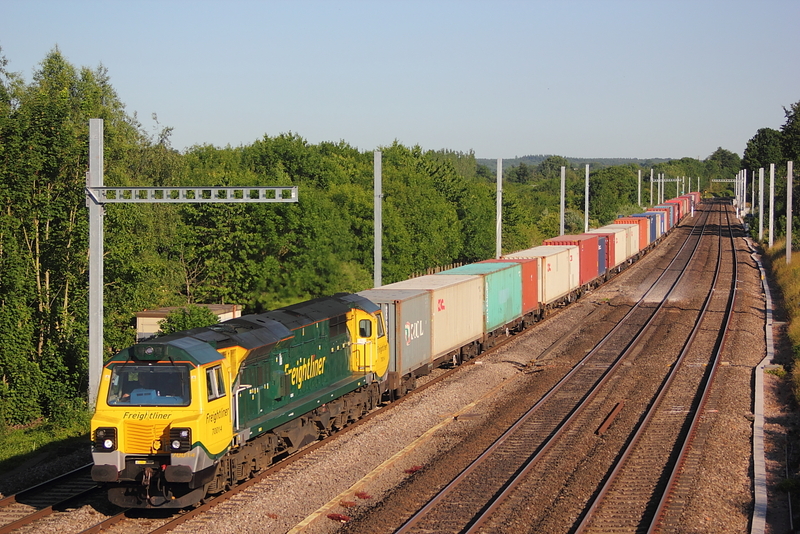 70004 4O54 Leeds to Southampton liner diverted via Swindon and the Wylie route. 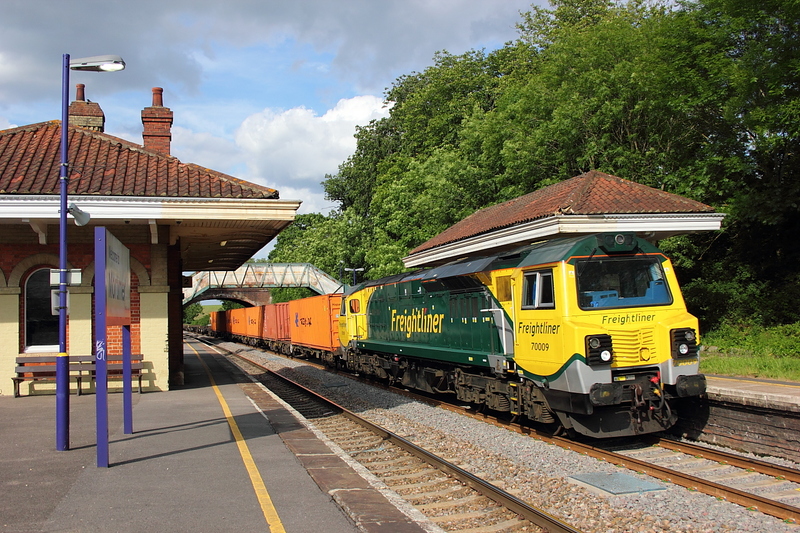 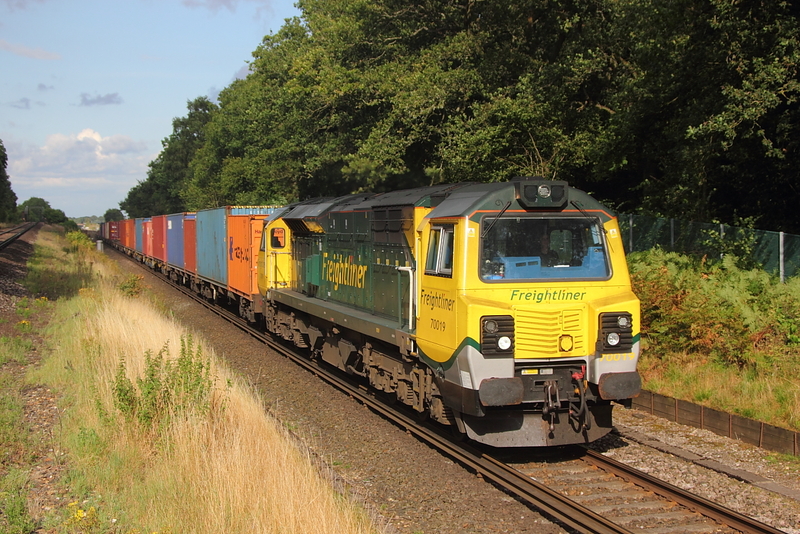 You wait over 2 hours with no freights then 2 turn up together and on approach looked like a passing shot was on the cards ,however 70015 on 4O51 Wentloog to Southampton was going a lot slower than 66182 on 6Z47 seen going away in the distance. 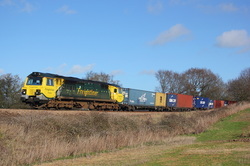 I had intended to phot the Eastleigh to Hoo further along the walkway,however has the overnight front had not cleared enough to allow the rising sun to show its face,i took the lazy option and sat in the car before continuing my journey,and would you believe it ,on hearing the 70 toot passing the nearby foot crossing,the sun makes an appearance....hence this grab shot. 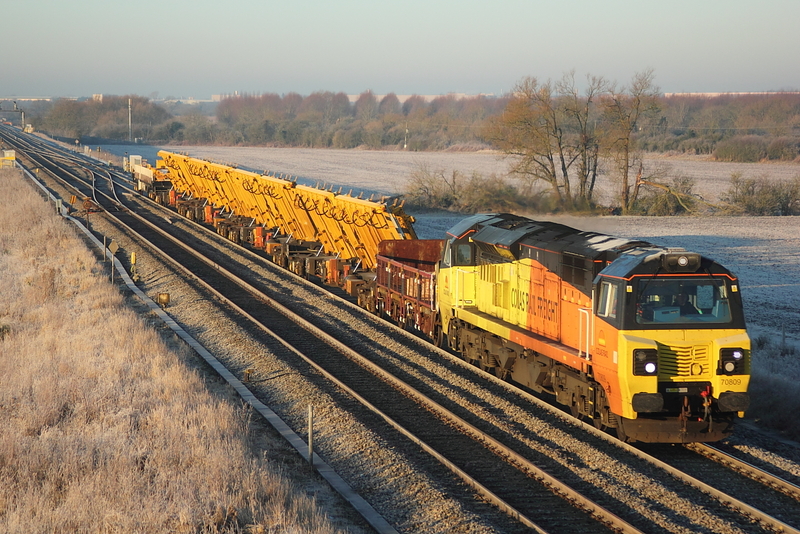 70809 passes a frosty Bourton with 6X50 Westbury to Bescot engineers. 7--17 4O09 Trafford Park to Southampton liner. Worting Jnct. 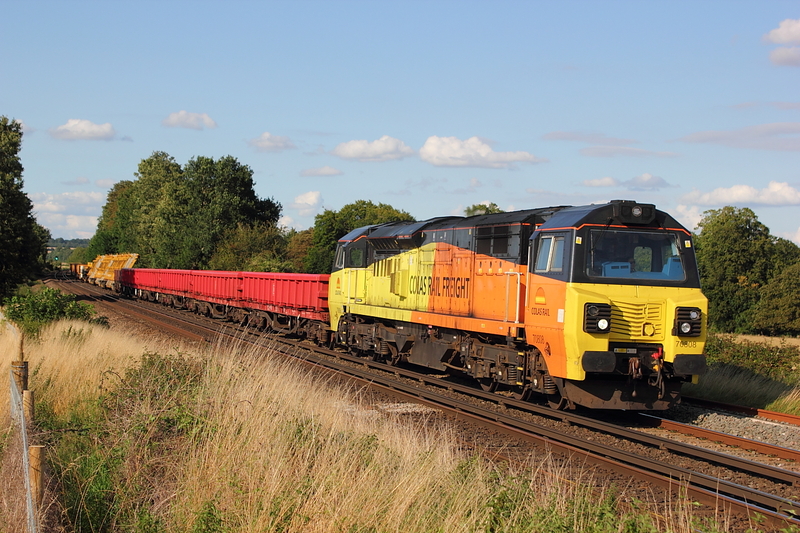 as always been a handy shot after work on the way home but as autumn approaches the sun angle gets worse ,and the warning signs are here has even at 5.30 pm the change from a month ago is apparent,so it wont be much longer before a shot of 6Y42 Hoo to Eastleigh will be gone,for some time at this location anyway,however 70802 did the honours this evening,but will they still be on this type of work in 6months time. 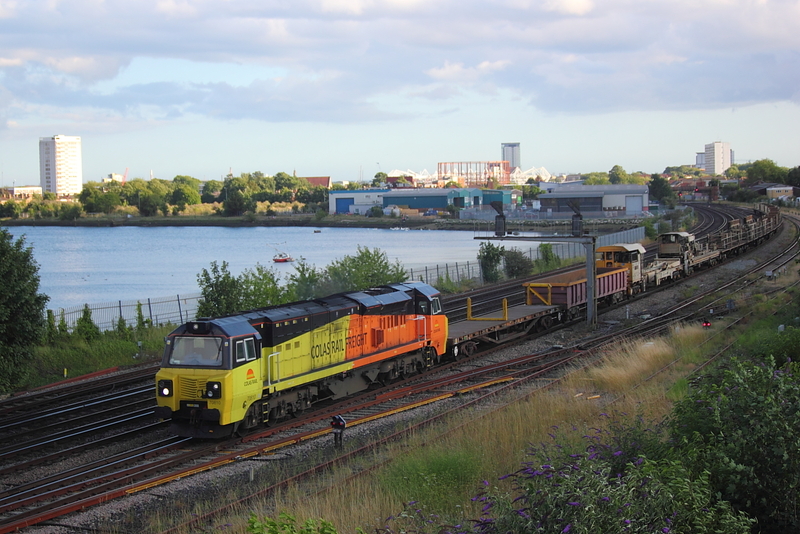 In the very last sunny gap before it was lights out,70019 pass the crossing at Oakley on 4o09 Trafford Park to Southampton liner. 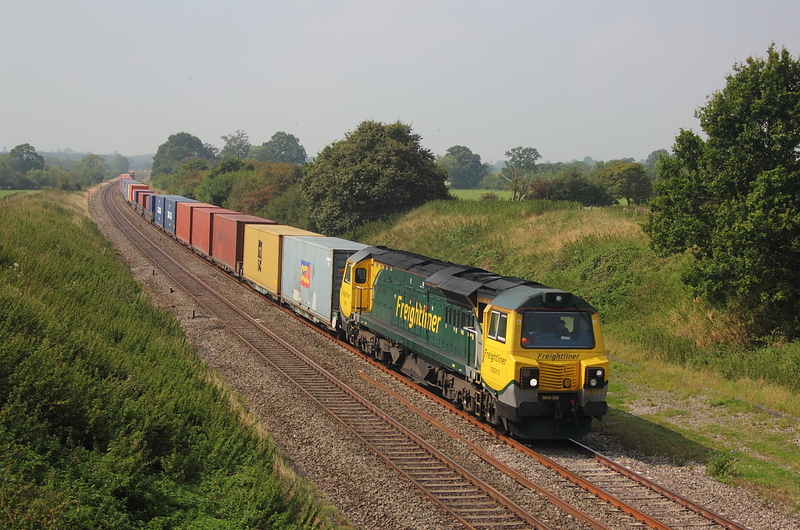 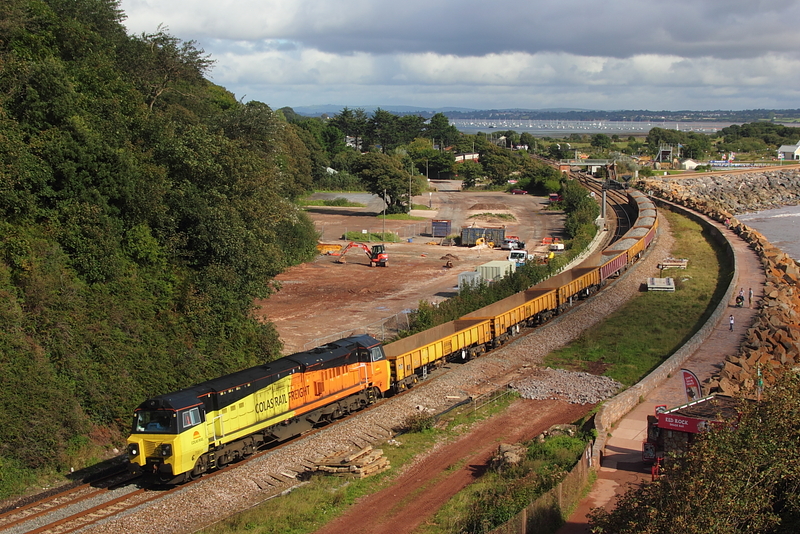 On a day offering very limited sunny spells,local shots were the order off the day,and with 3class 70s on liners passing within 20 minutes off each other,theres no time to move,with one in cloud and another at the standard view,the 3rd done broadside from a distance,as here with 70020 on 4M61 Southampton to Trafford park liner,with Oakley cricket club just visable above the containers. 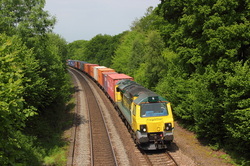 70013 passes Worting Jnct. with 4O15 Hams Hall to Southampton liner,luckily on the main. 70001 4M99 Southampton to Trafford Park liner. 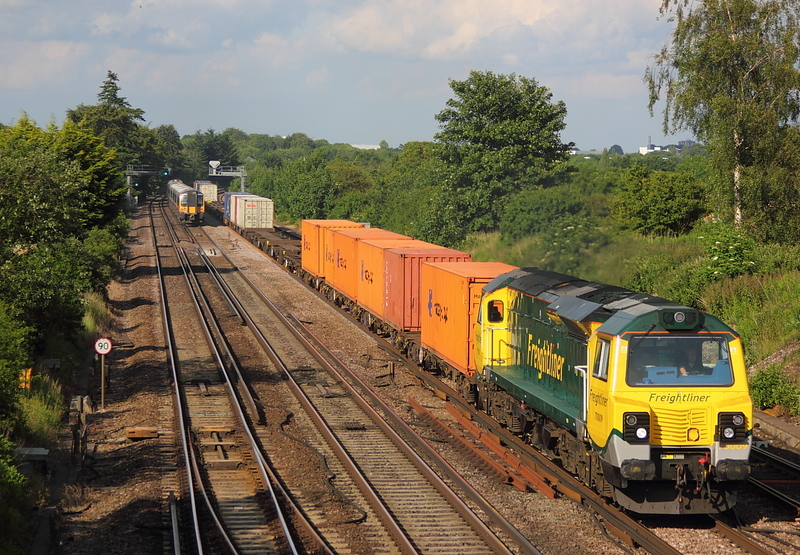 "In your face jobby",as 70806 passes on 6Y42 Hoo to Eastleigh yard. 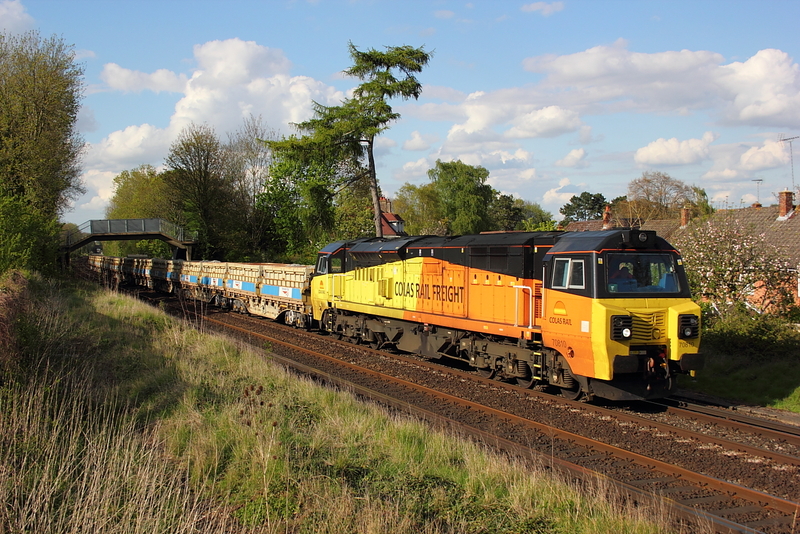 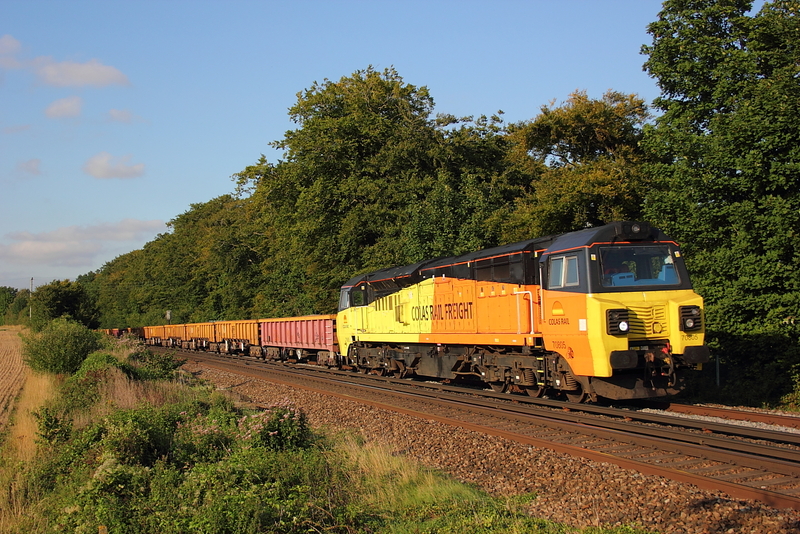 Been trying to crack this shot ever since the Colas class 70s first appeared on the evening Hoo to Eastleigh,but until now beaten by cloud,non runner or light engine(later two usually in sunny conditions no doubht),but finally 70808 passes in glorious evening weather on 7Y42 conveying autoballasters. 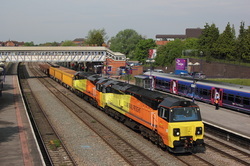 70016 thunders through the station on 4O09 Trafford Park to Southampton liner. 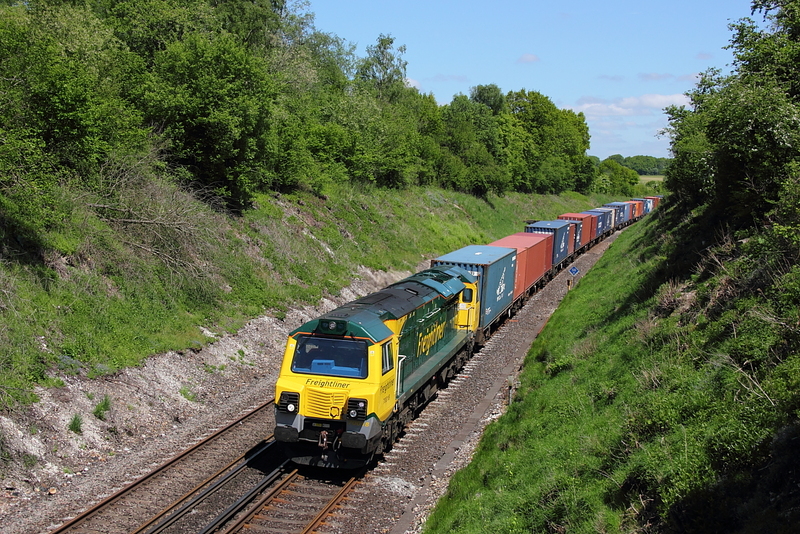 Although devoid of any containers on the front end it does allow a mediocre view of the entrance to Micheldever or Litchfield tunnel. 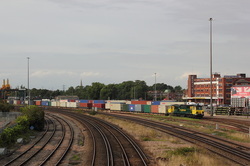 The construction on the far right hand side,just above the stored car carriers,is a wartime RAF fuel and oil depot,built in 1939 and continued to receive fuel until approx. 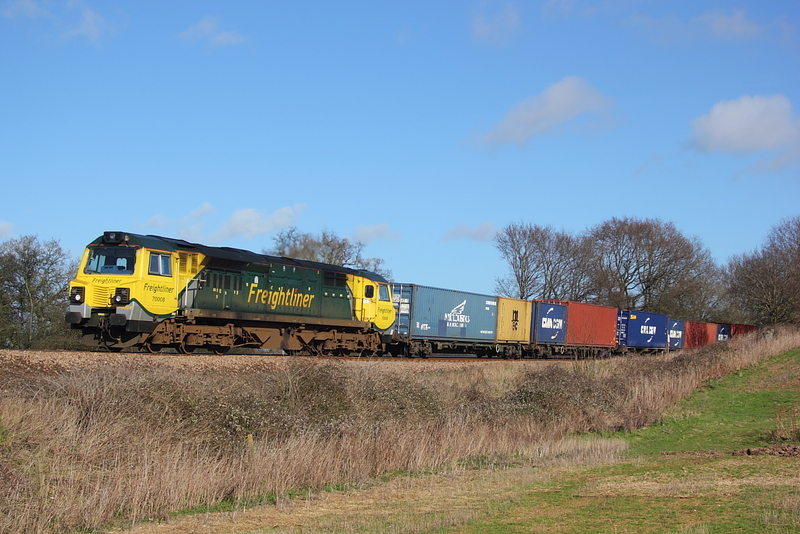 1995 from Ripple lane,and seemingly is still on the reserve list. 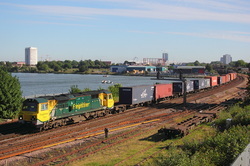 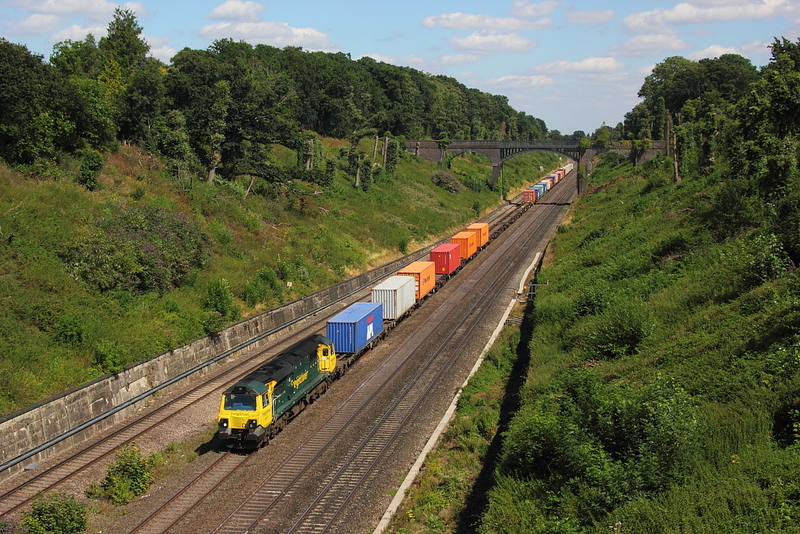 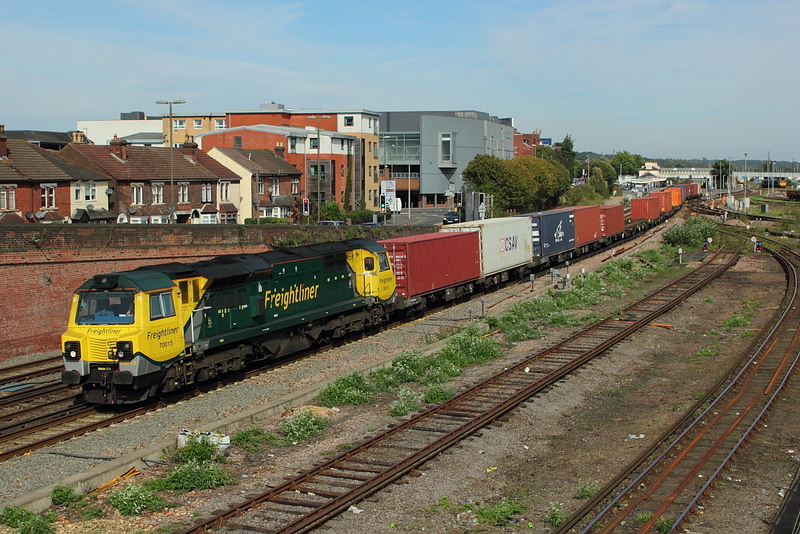 70009 Trafford Park to Southampton liner. 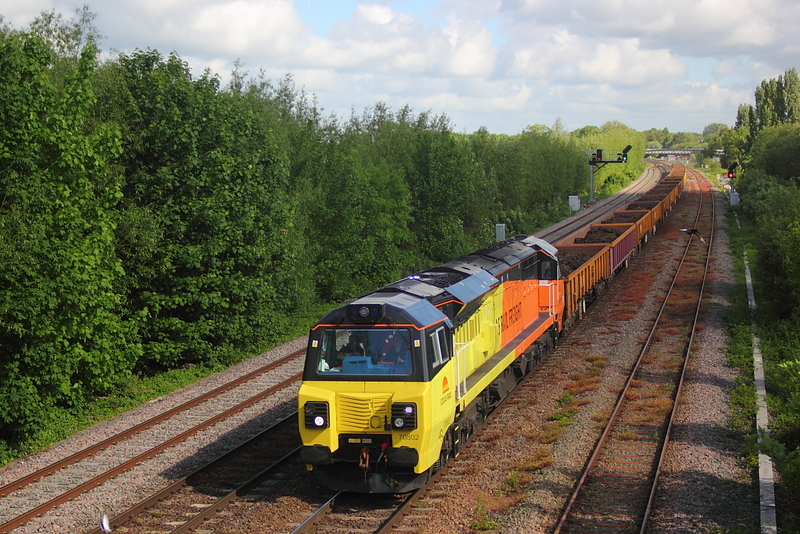 With the sun somehow peering through an otherwise blanket of cloud cover ,and at least illuminating the foreground,Colas 70802 passes Worting Jnct. 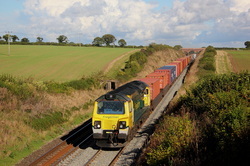 on 6Y42 Hoo Jnct. 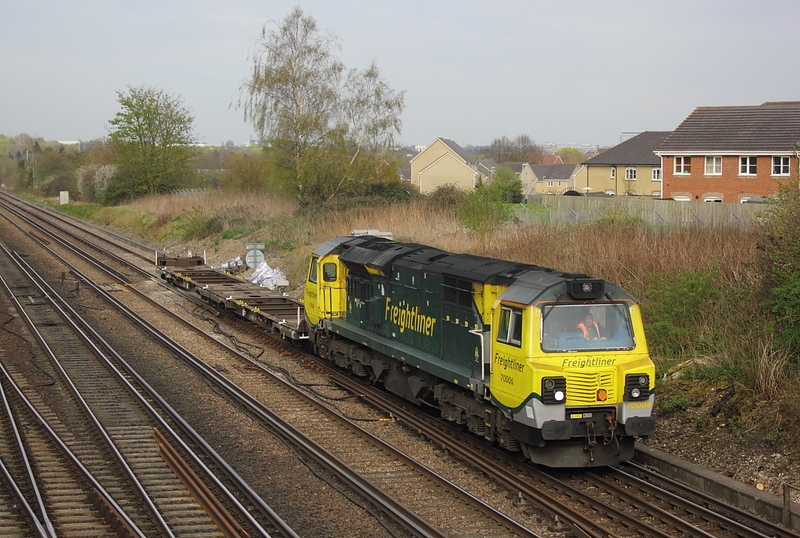 to Eastleigh.Looks like theres a bit of trackbed renewal somewhere this weekend ,with 2 crawler dozers in the consist. 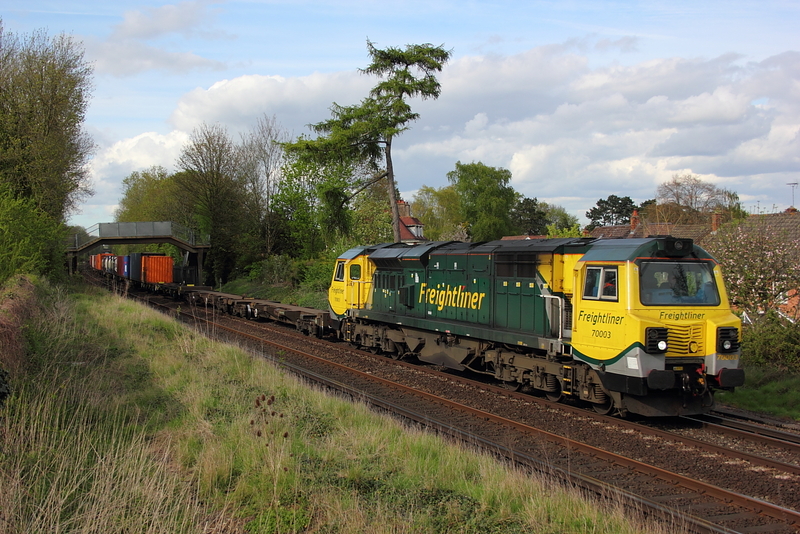 Running 95 minutes late ,70804 powers up the main with 6y41 Eastleigh to Hoo,and luckily the delay combined with a change of wind direction,blowing all the high cloud back eastwards,which had engulfed the area earlier. 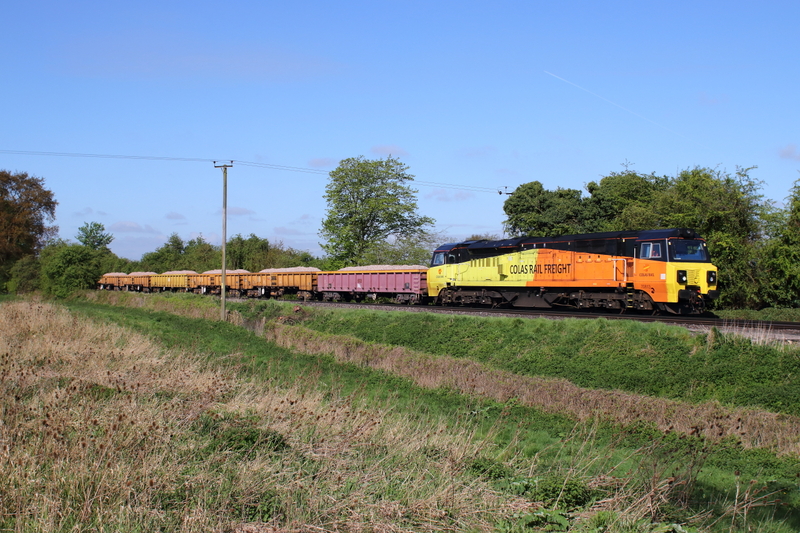 Running 42 minutes late passing Worting Jnct. 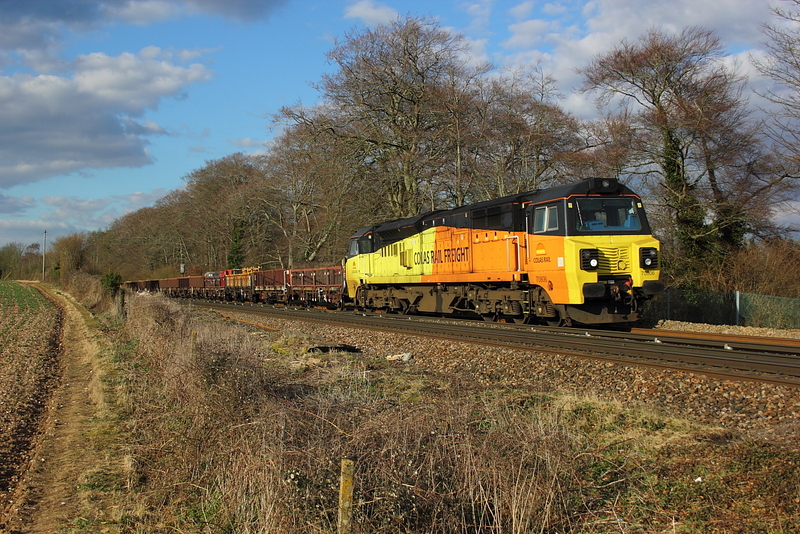 was probably why 6Y42 Hoo to Eastleigh hammered down the fast ,with 70805+70806+66849"Wylam Dilly",and the sun just coming out at the crucial time. 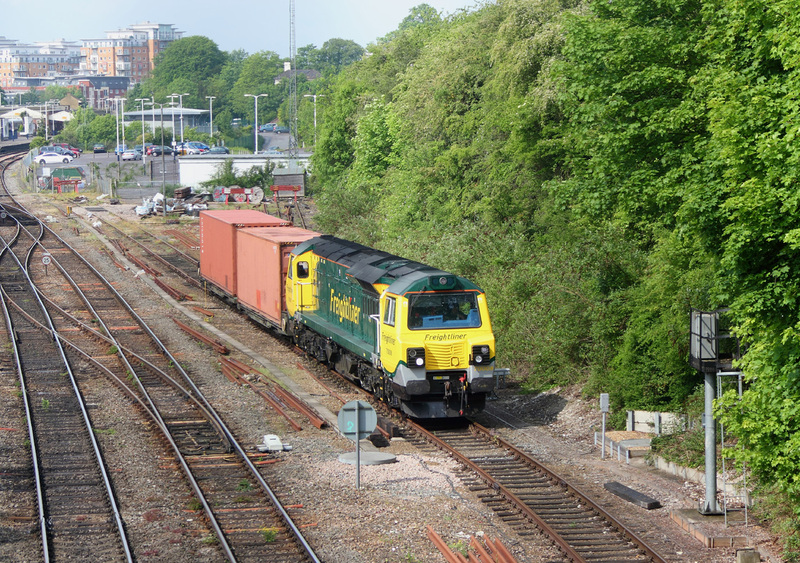 70017..4O18 Lawley St. to Southampton liner. 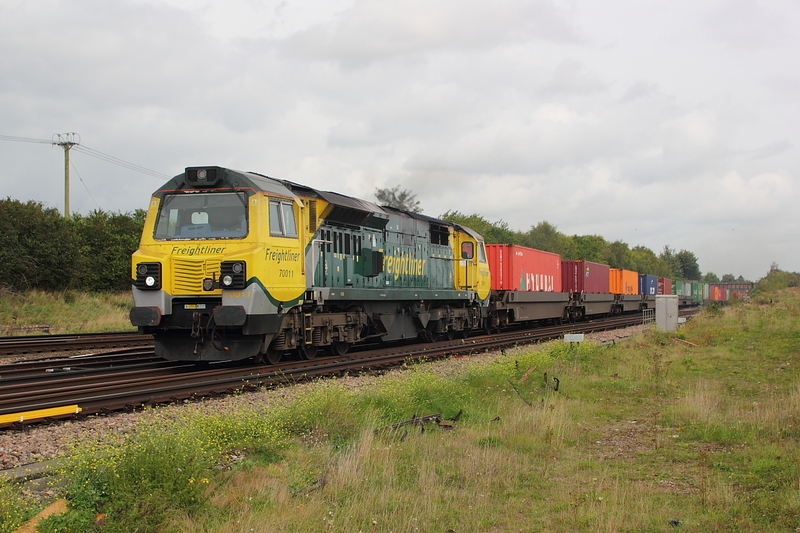 70015..4O09 Trafford Park to Southampton liner. 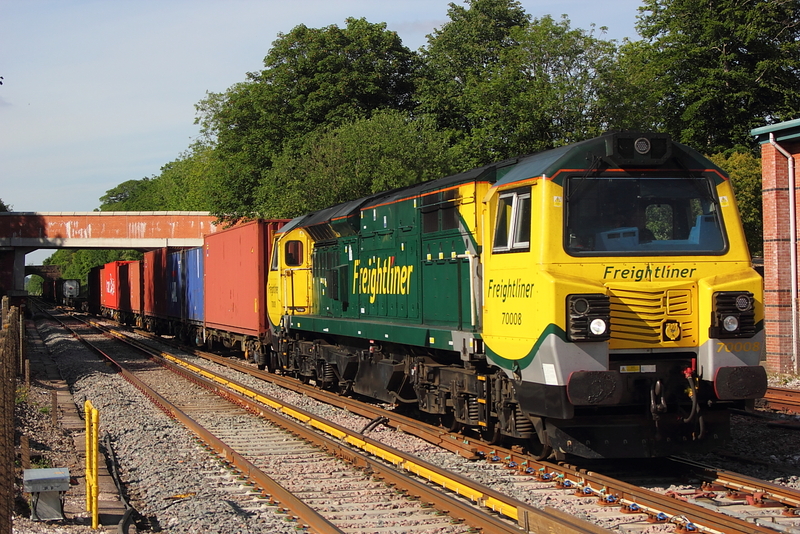 70001..4O09 Trafford Park to Southampton liner. 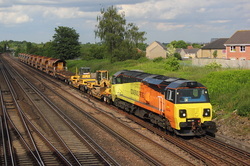 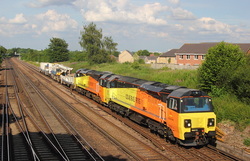 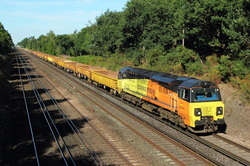 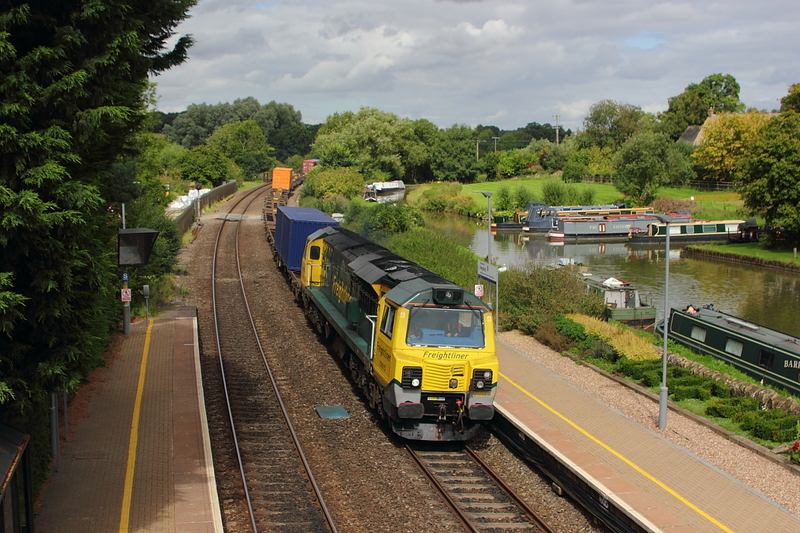 Reputed to be the first time a Colas class 70 appears on the Eastleigh to Hoo jnct. 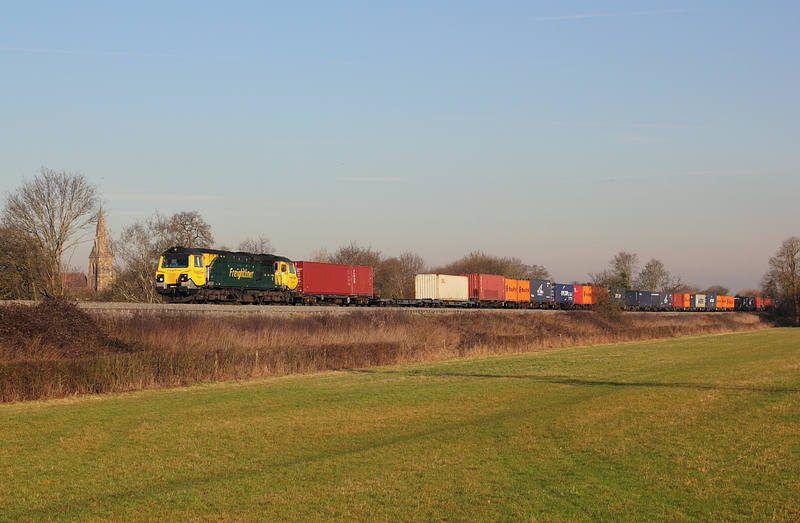 circuit was on the morning 6Y41 to Hoo Jnct. 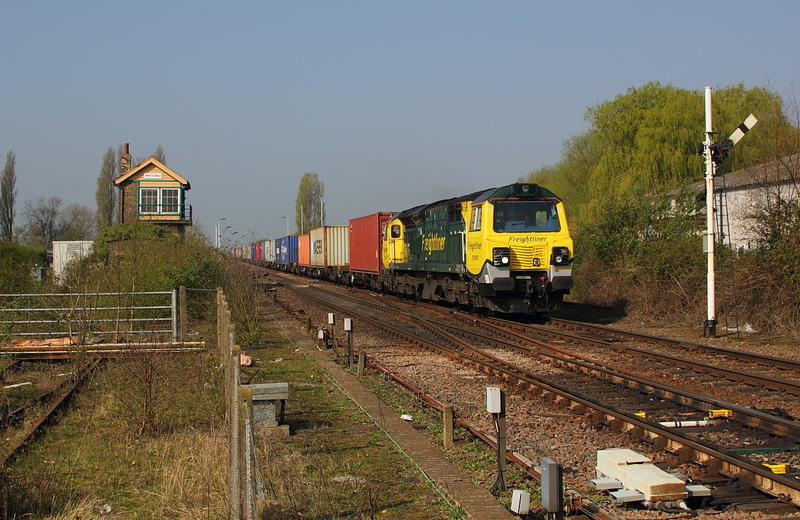 and later in the day returning on 7y42 (presume due to the crane) to Eastleigh,but alas not in sun as 70802 passes Worting Jnct. 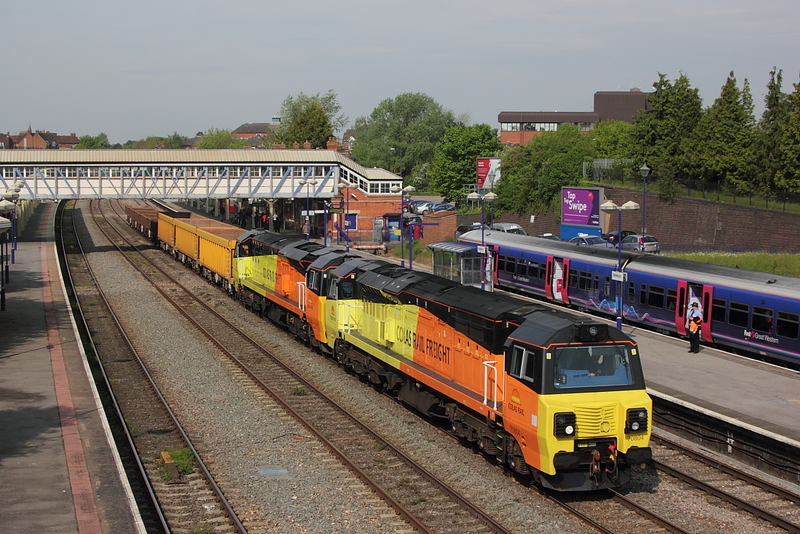 First sight of the new Colas class 70,for me ,let alone phot one in the sun,but it all came into place today with 6M50 Westbury to Bescot running on a Bank holiday Monday,and routed away from its normal Swindon route but instead up the B&H,and seen here passing Newbury with 70804+70801 in charge . 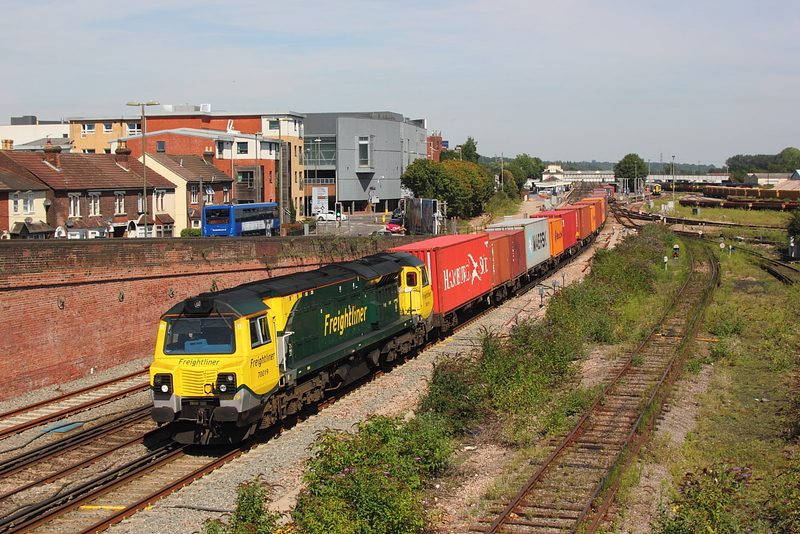 70008..4O09 Trafford Park to Southampton liner. 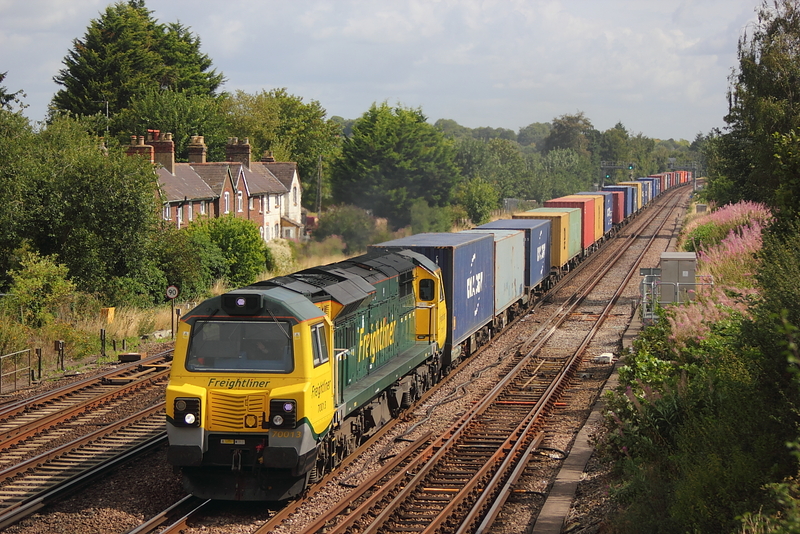 70007..4O51 Wentloog to Southampton liner. 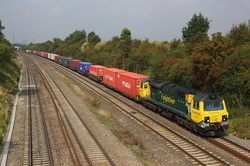 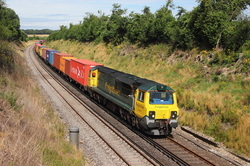 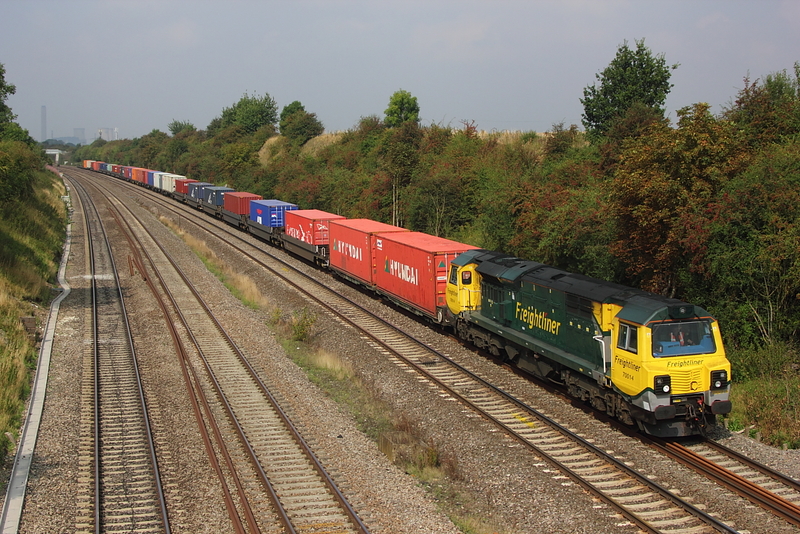 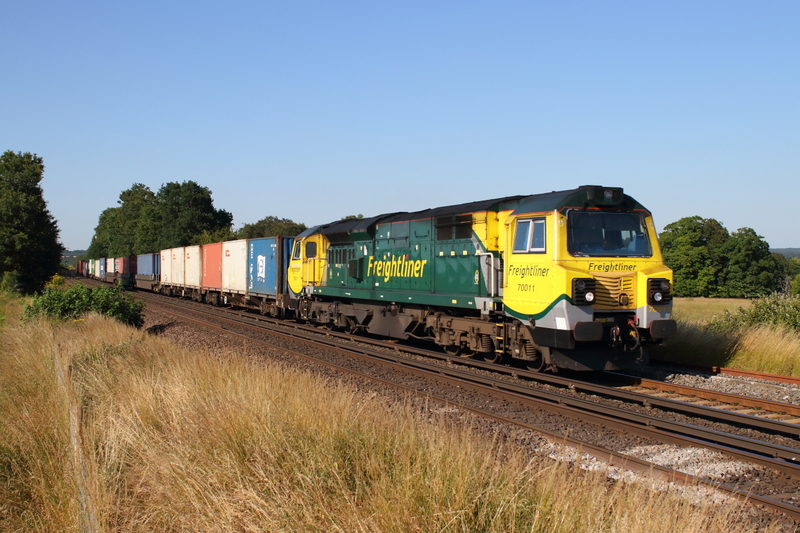 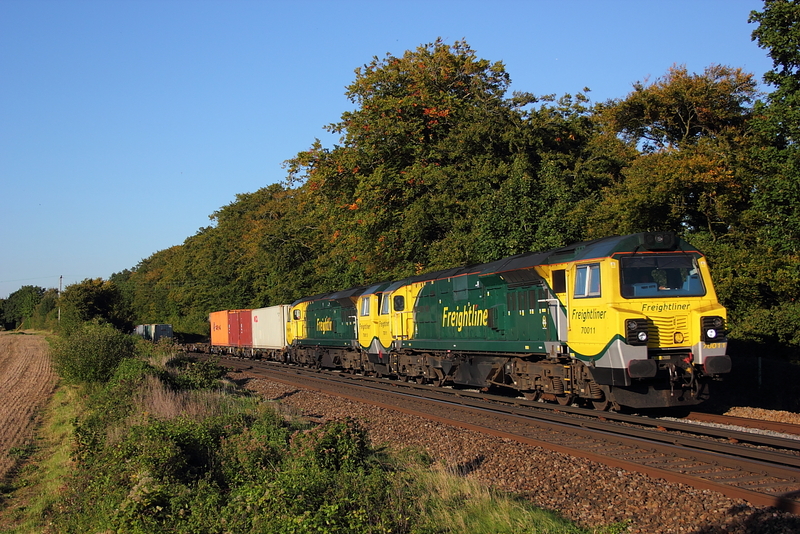 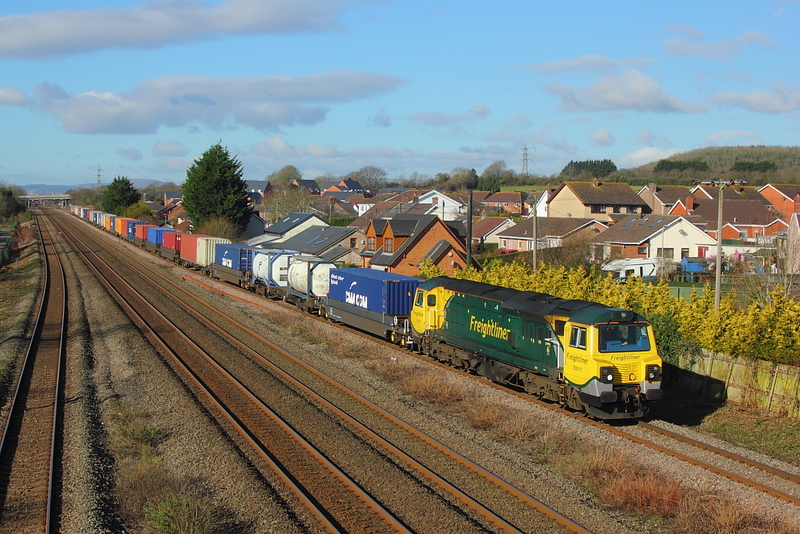 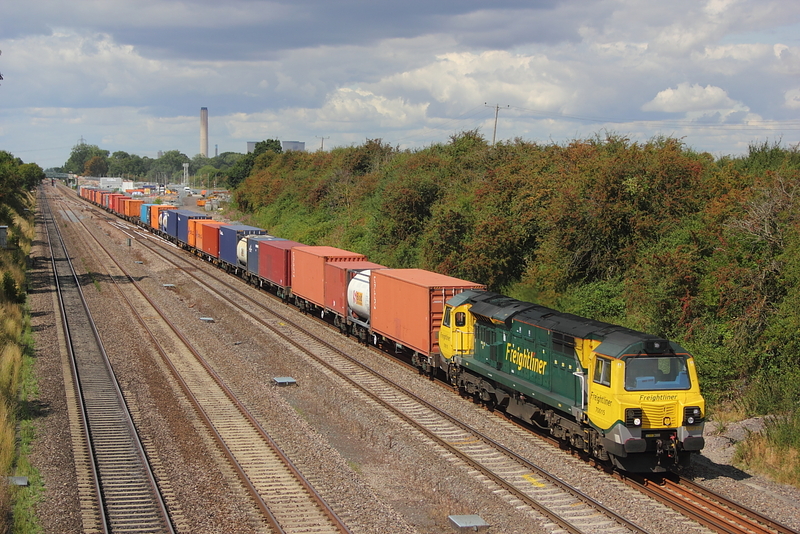 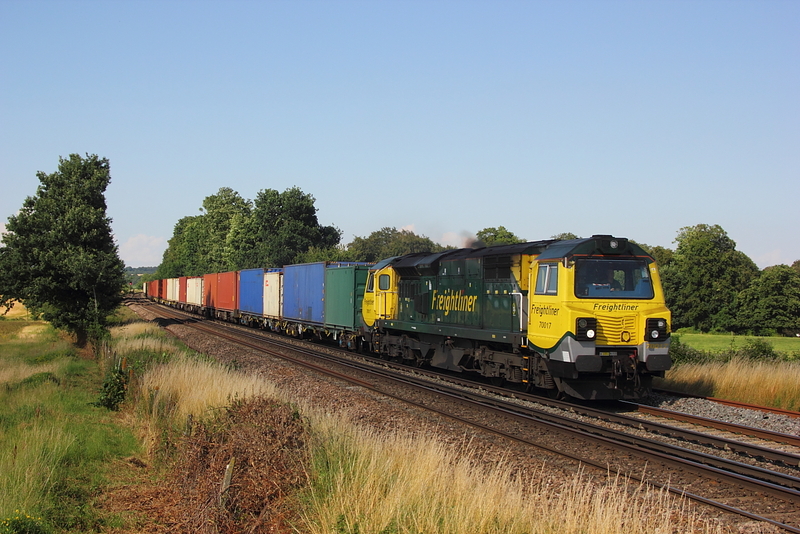 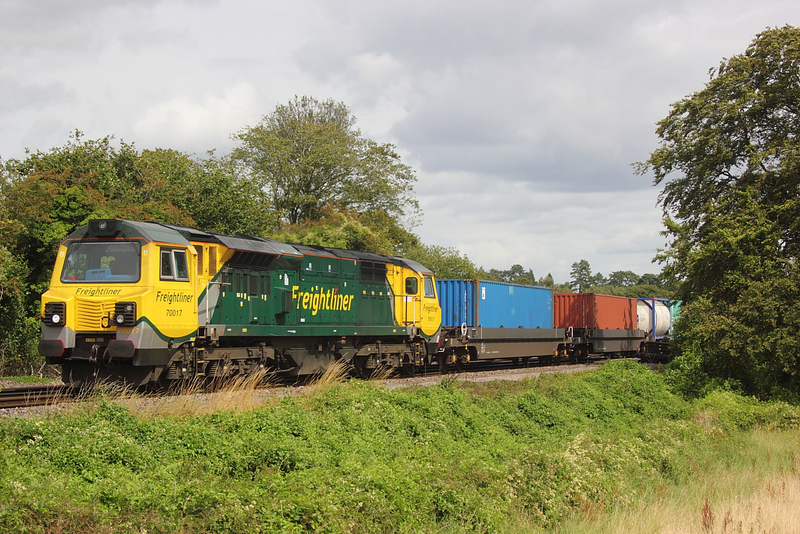 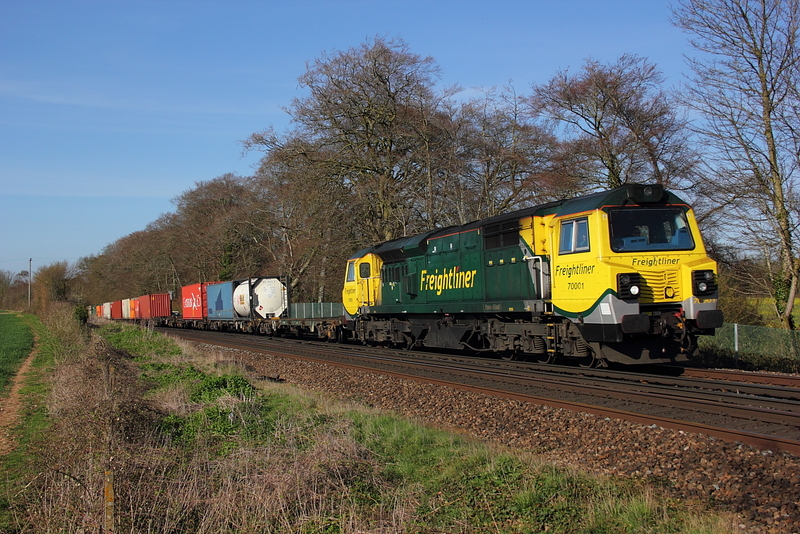 Fast shutter speed required here, as 70009 hammers through Mortimer station with 4O09 Trafford Park to Southampton liner,yet today and on previous occasions the Voyagers pass more sedately,whats that all about.Although it looks like a sparce load,there was more containers on the rear but out of veiw. 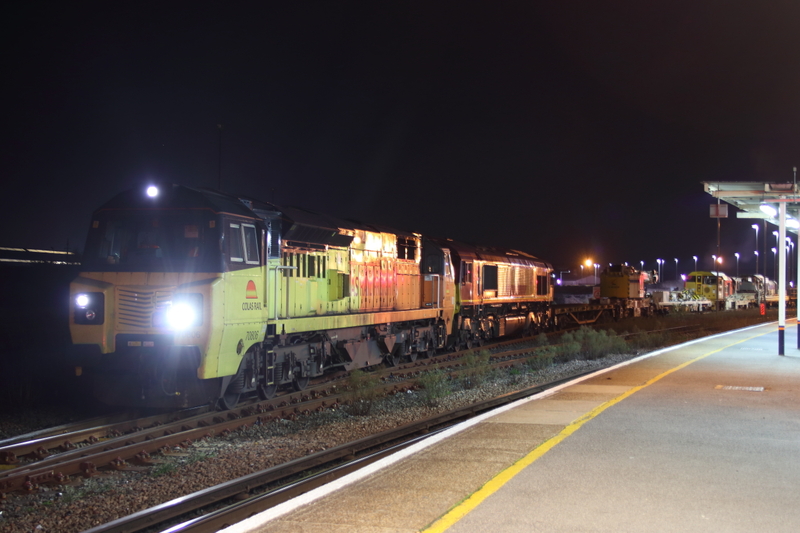 70001..4O29 Crewe to Southampton liner. 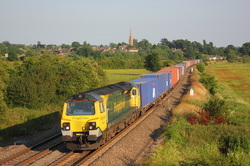 02/06/11 Didcot North Jnct. 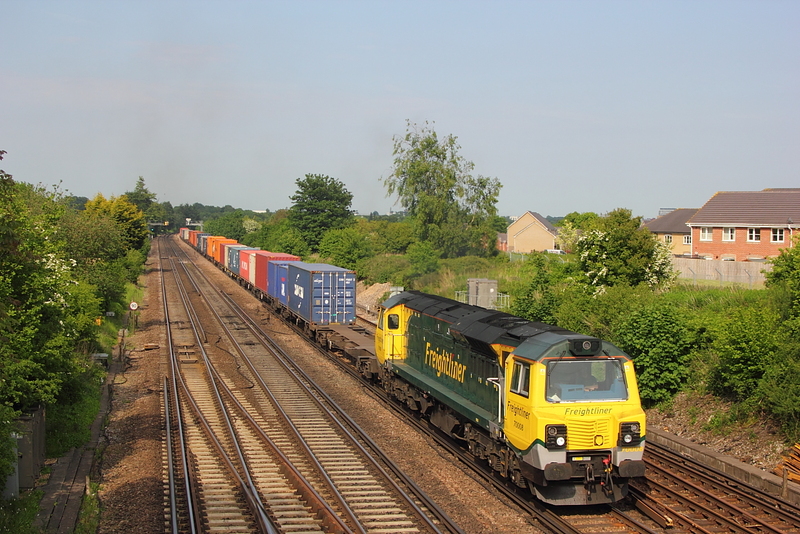 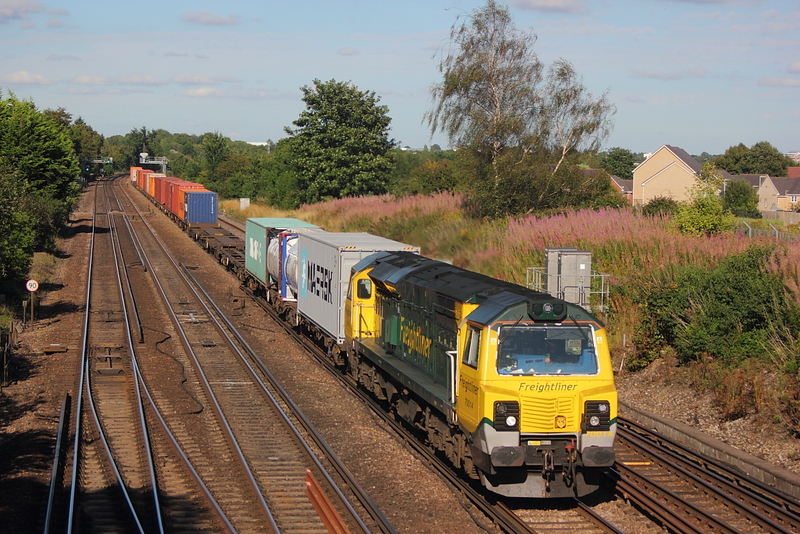 70008..4O14 Birch Coppice to Southampton liner. 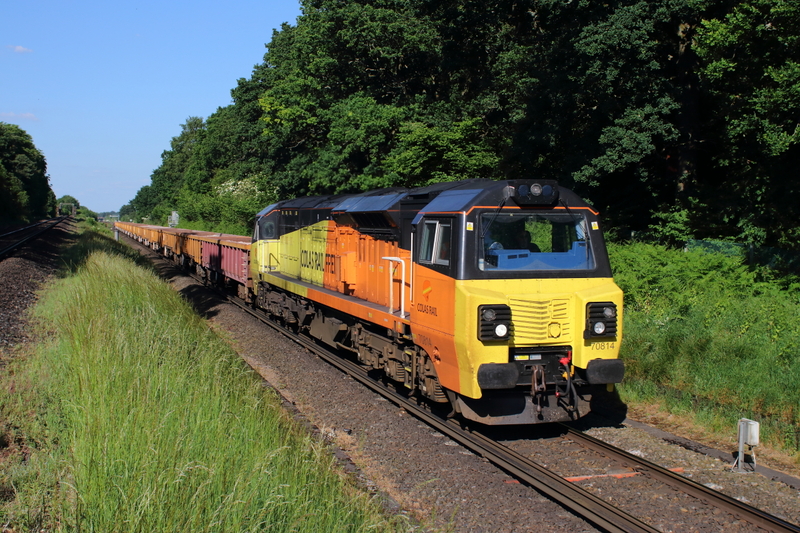 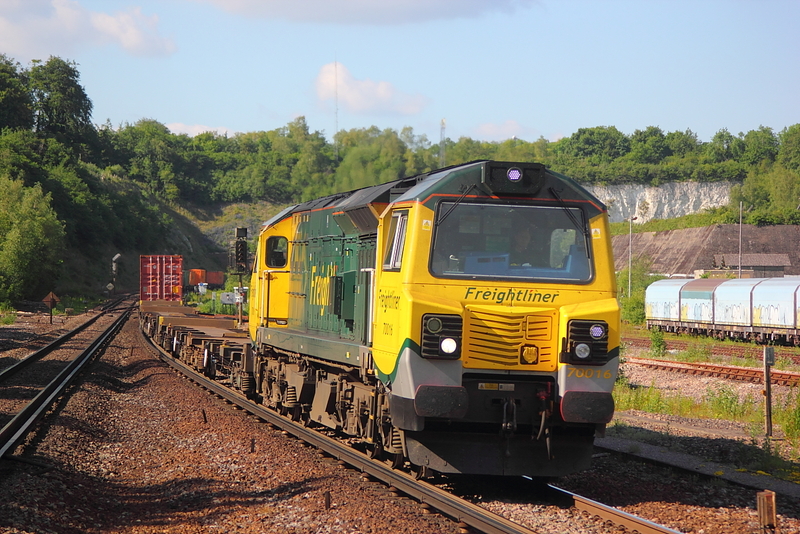 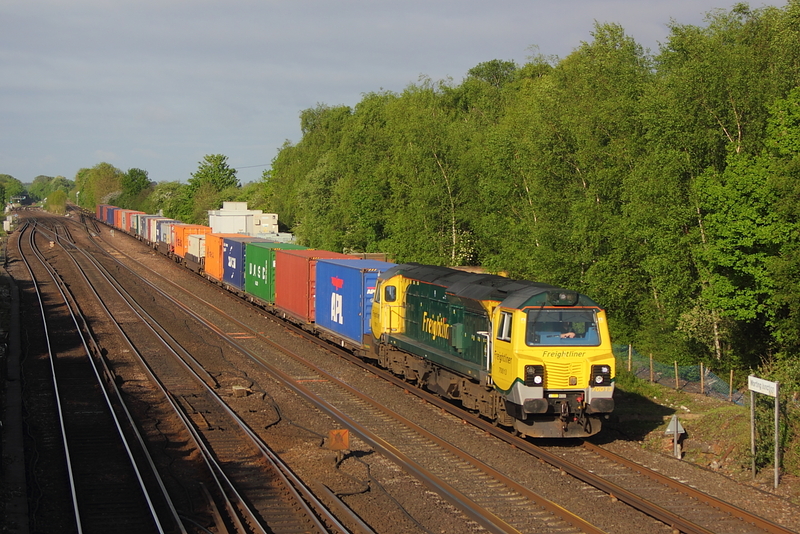 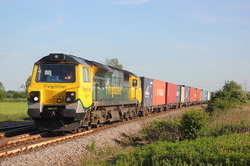 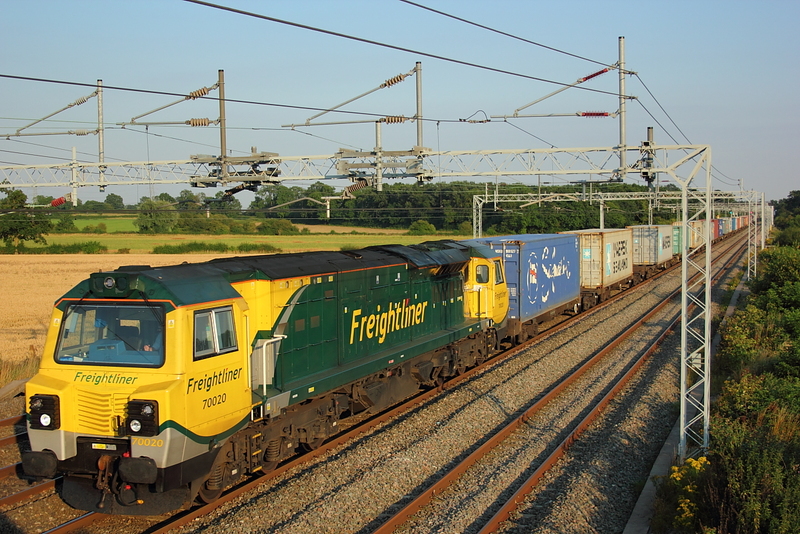 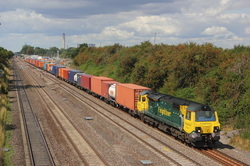 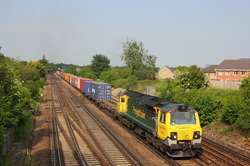 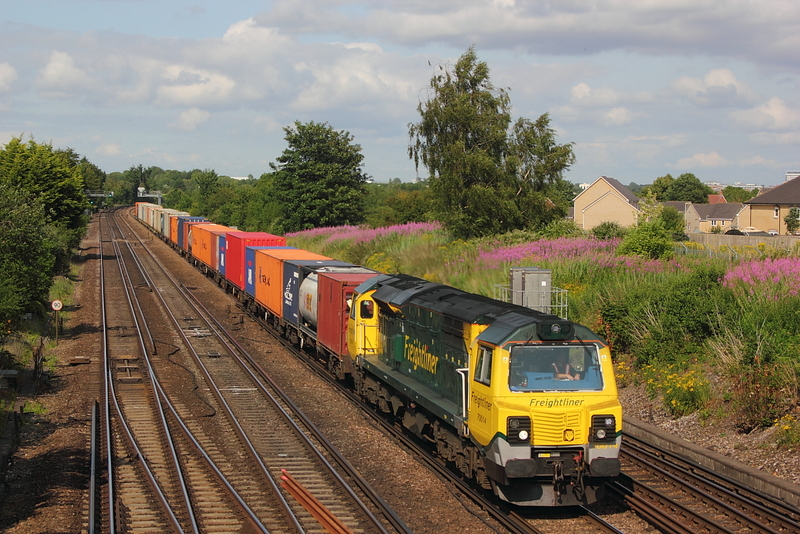 24/05/11..Lower Basildon..70001,6M99 Southampton to Trafford Park liner. 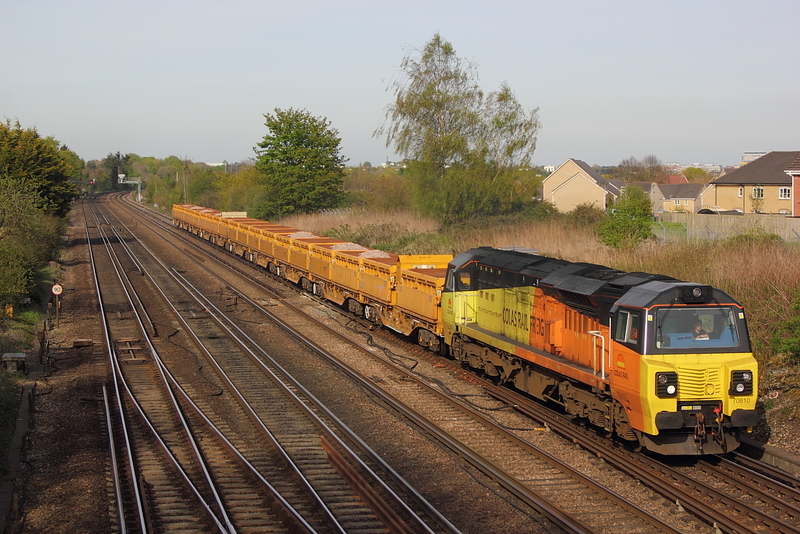 07/05/11..73008 pulls out of Basingstoke North Yard(well whats left of it )with 606173+606174 which had coupling problems on a down working the previous wednesday,with a headcode 4z66 the assemble headed to Southampton via Swindon. 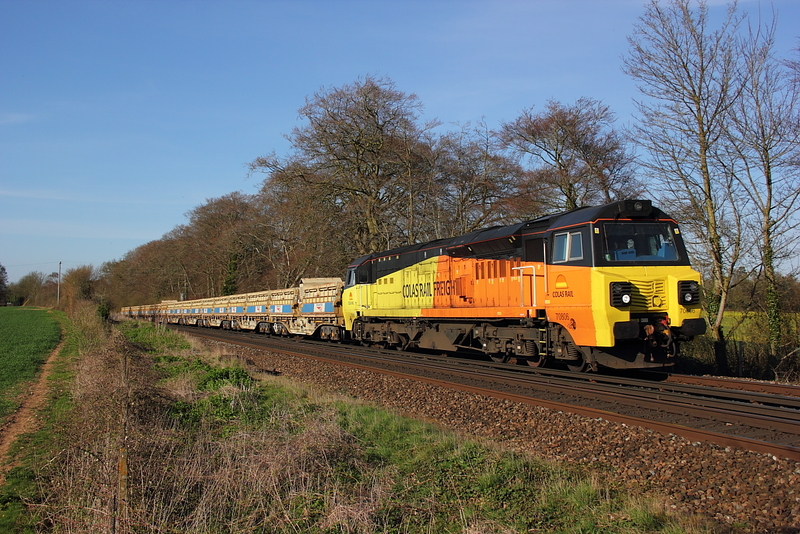 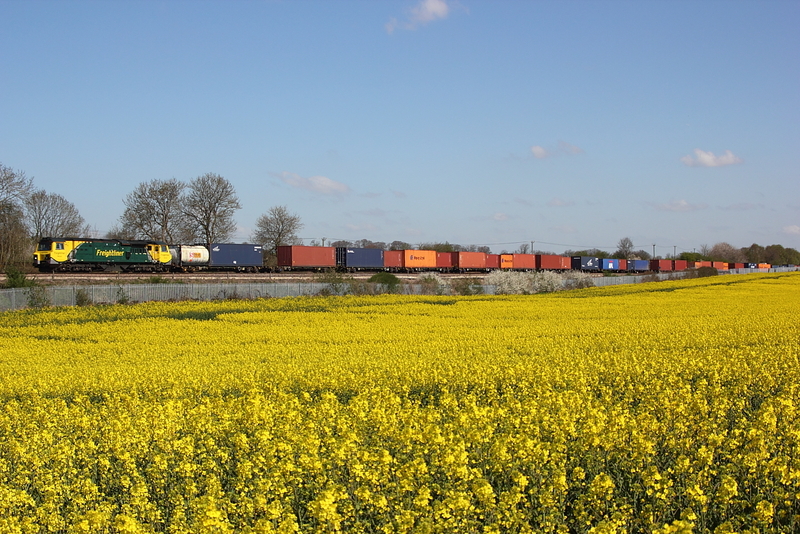 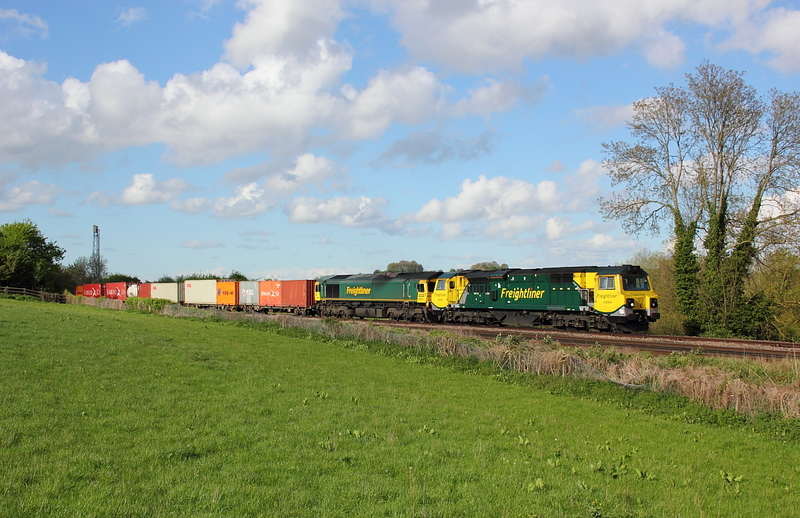 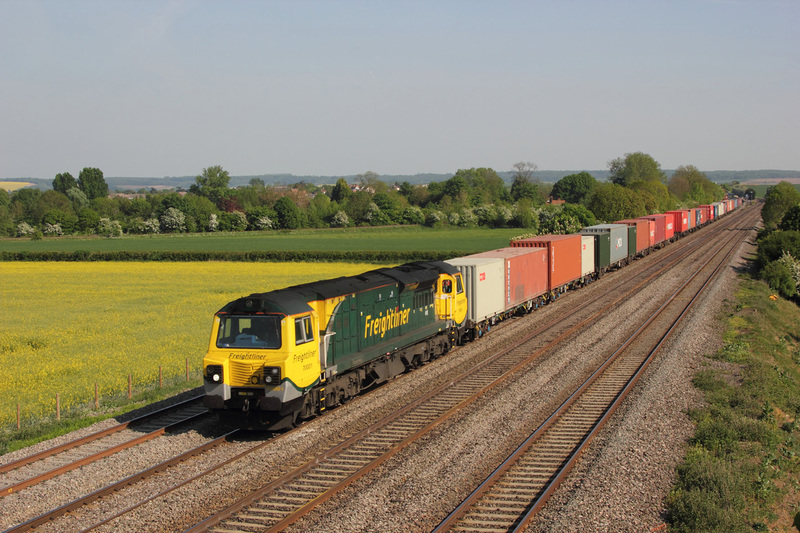 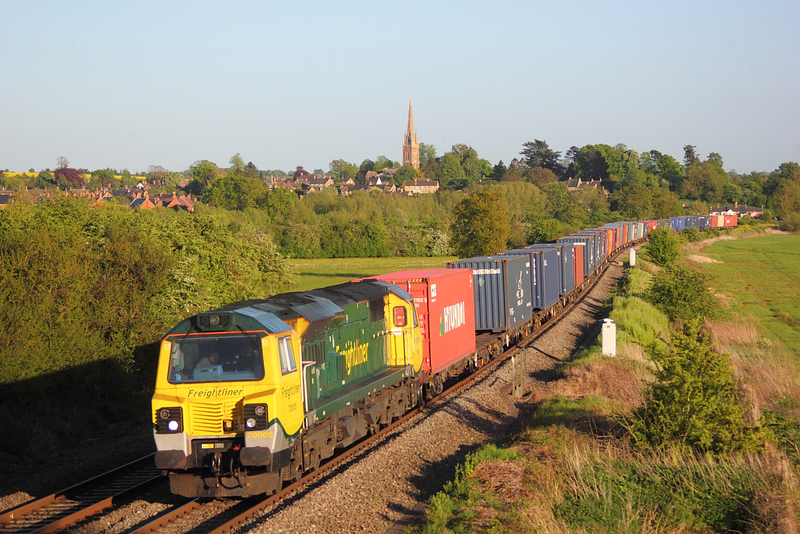 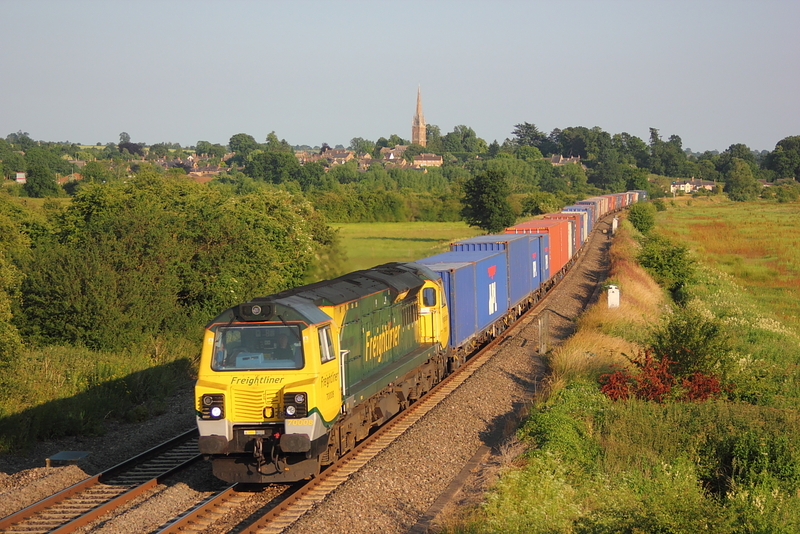 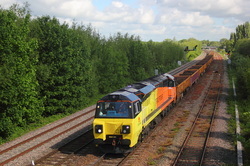 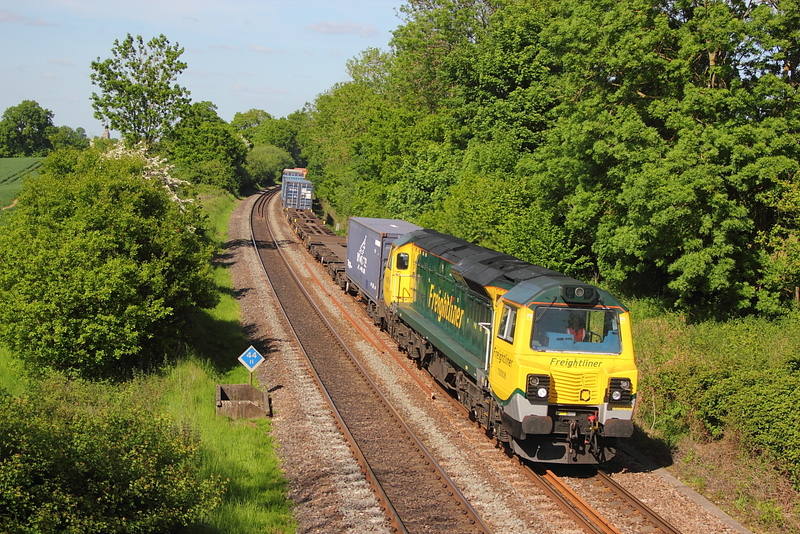 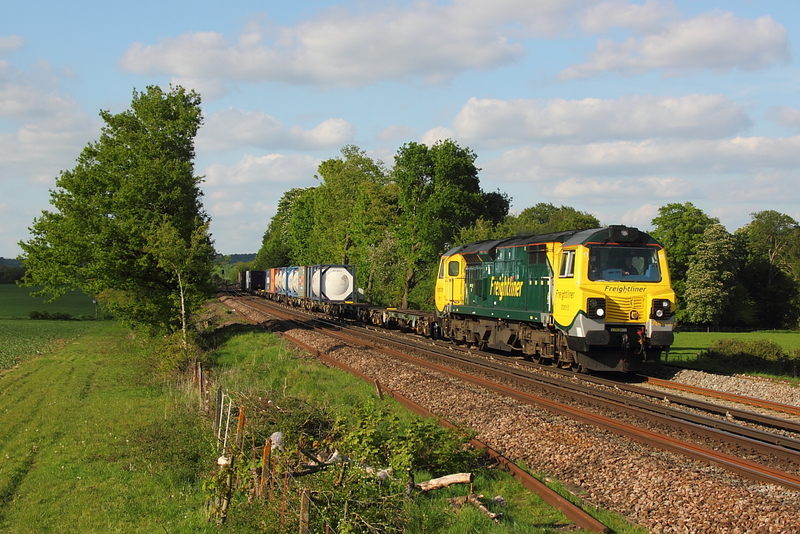 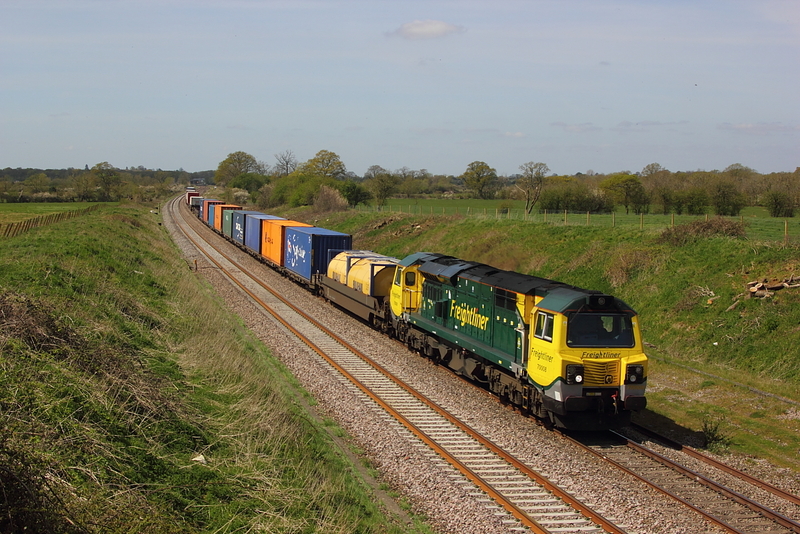 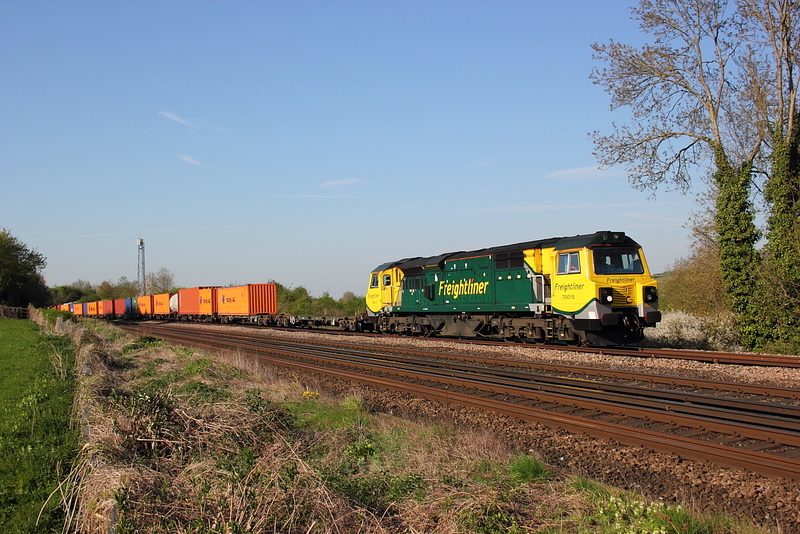 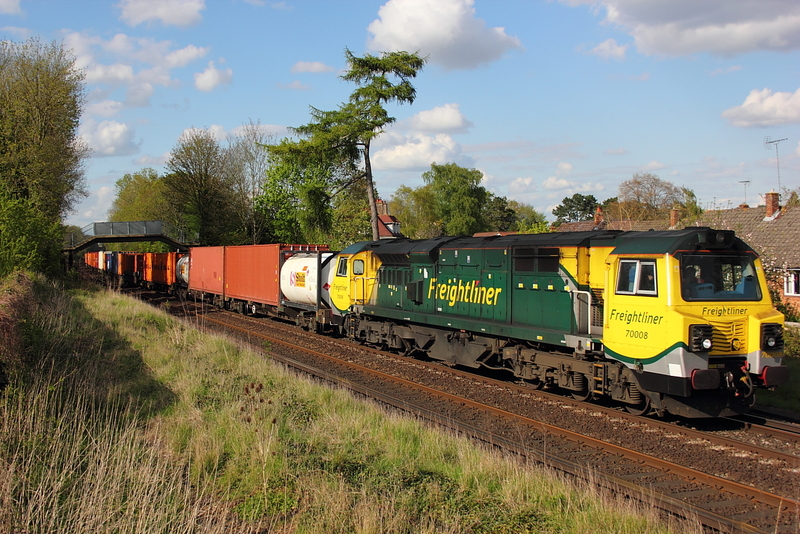 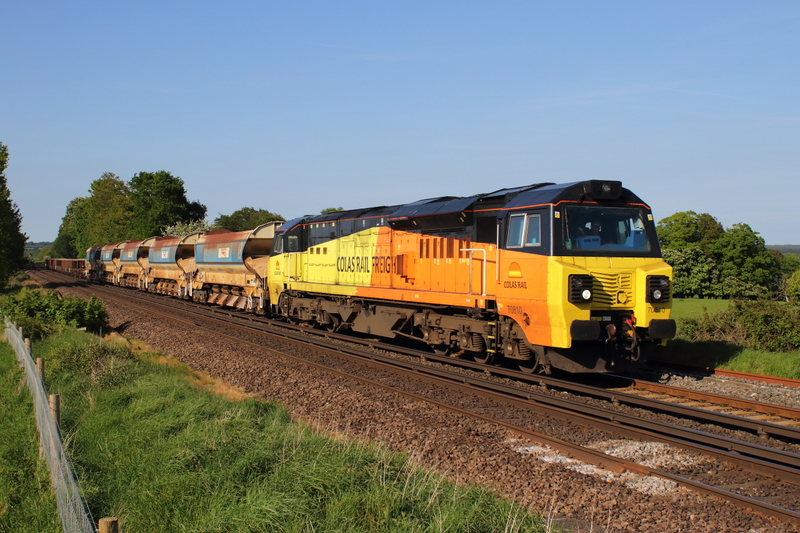 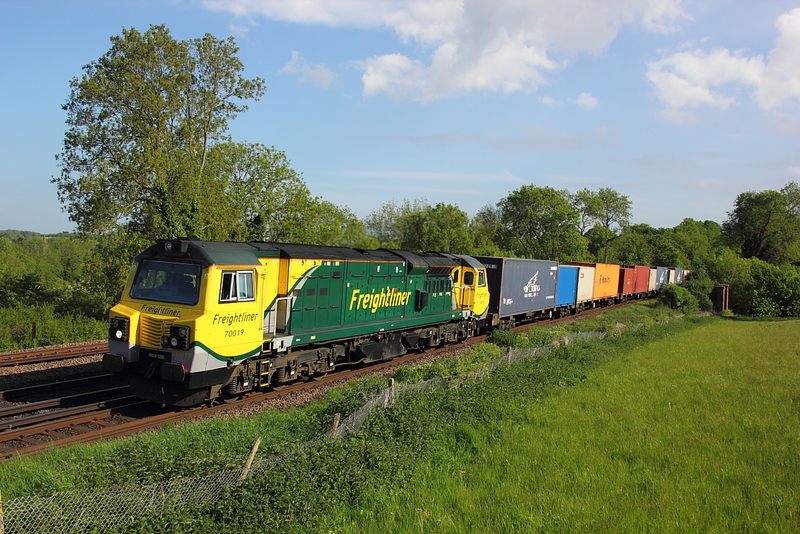 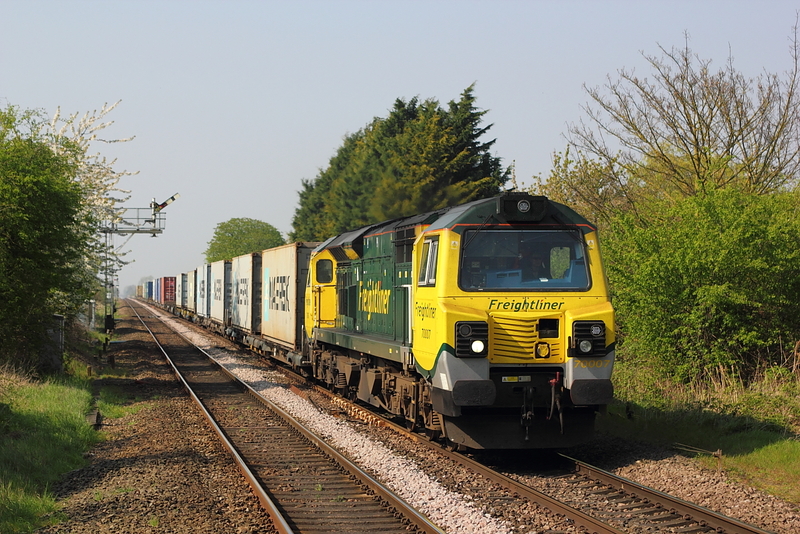 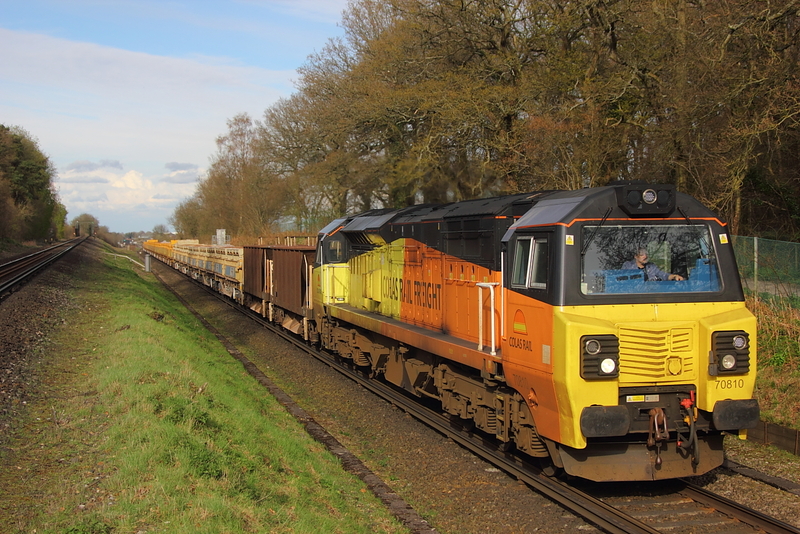 04/05/11 Manor Farm,Cholsey..70001..4M68 Southampton to Birch Coppice liner. 70004 Passes Badgeworth on 4V46,Rugeley P.S. 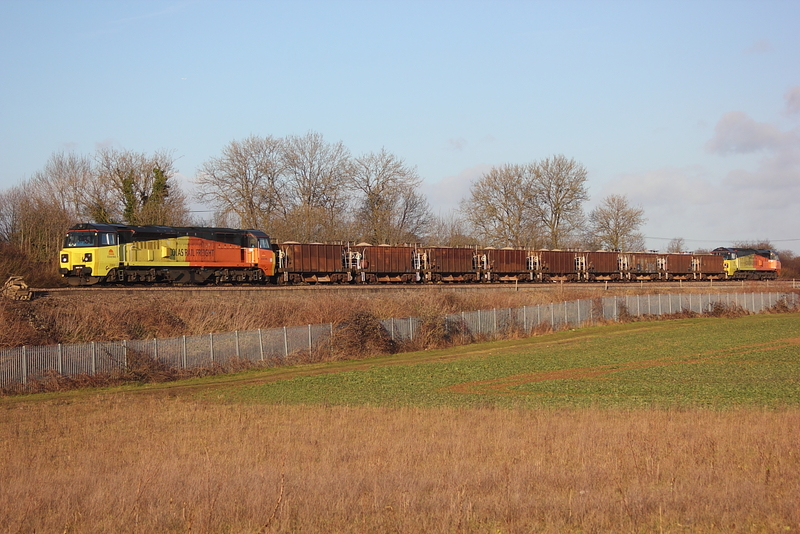 to Stoke Gifford coal ermpties. 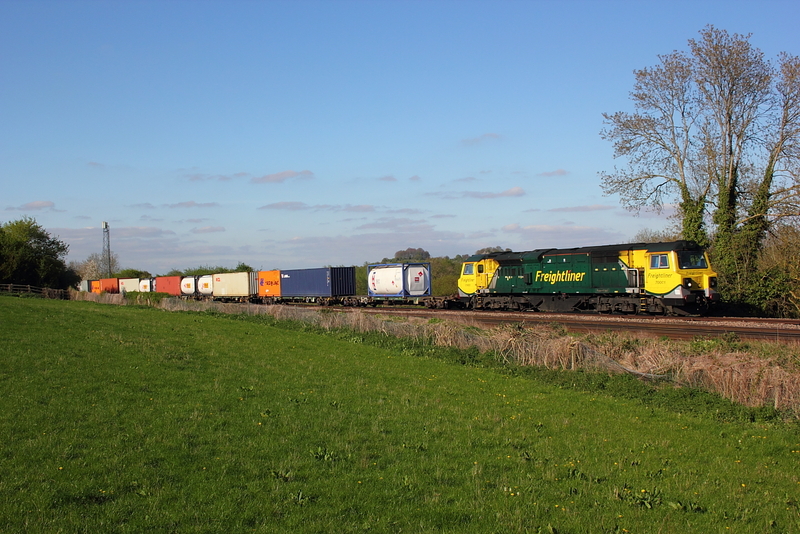 After a previous, failed attempt to get this 70 working (due to loco failure) my first shot off the class ,actually working was here at Gossington as 70003 powers past on 4Z70 Rugeley P.S. 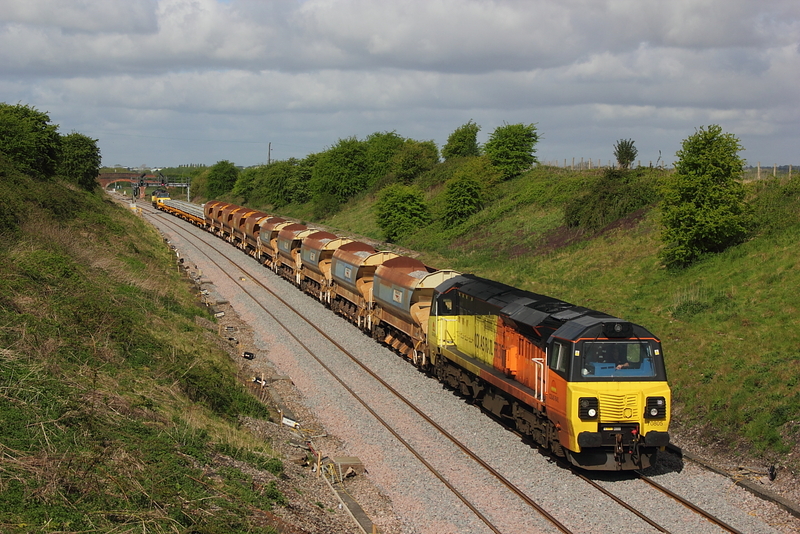 to Stoke Gifford coal empties. 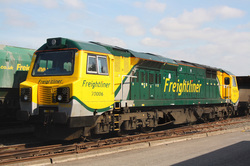 70006 sits at Stoke Gifford.